ARPHA uses one-stop registration/login for all its products. 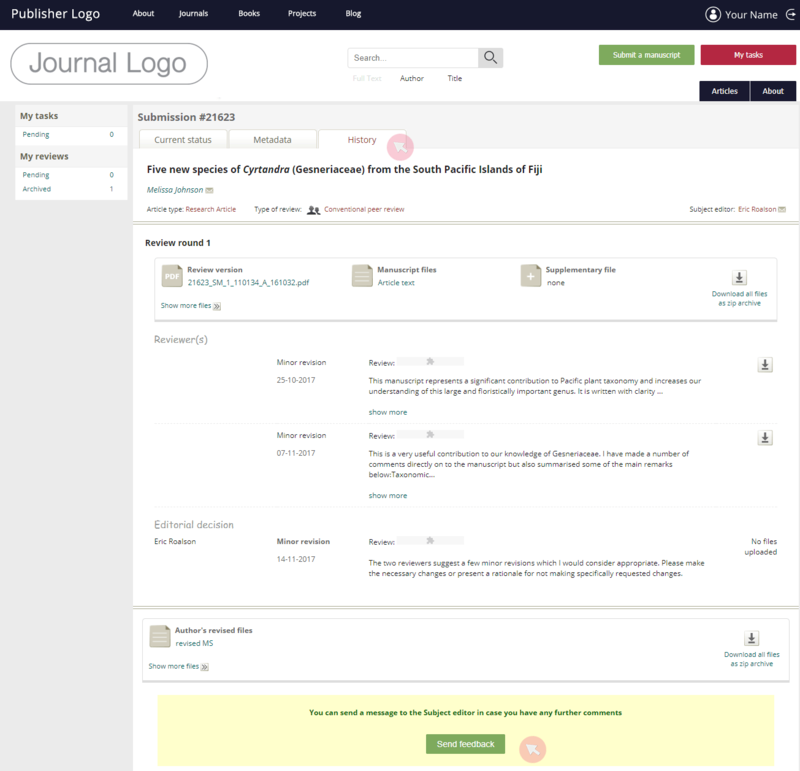 Once registered with ARPHA, users are able to author and review in all journals published on the ARPHA journal publishing platform. Listed below are guidelines relevant to all ARPHA users. For user-specific rights and guidelines, see the next chapters in the manual. 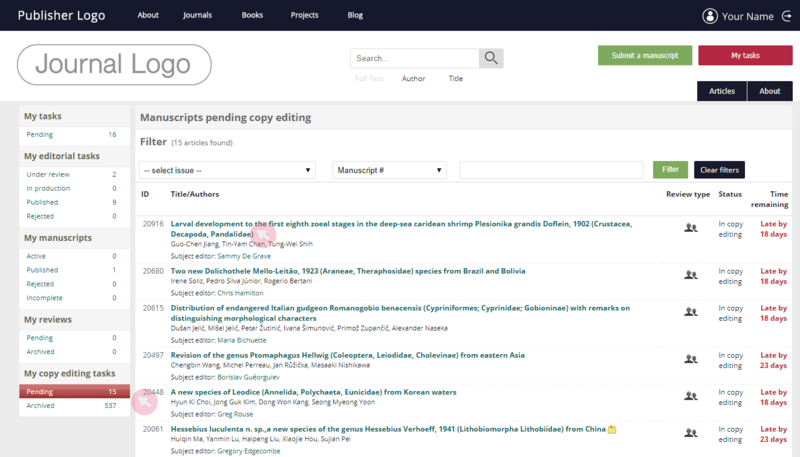 1 Register from the homepage of any journal published on the ARPHA platform. 2 Fill in the short form with your basic details (name, email address etc.) Make sure to fill the mandatory fields marked with *. 3 The next step suggests that you subscribe to a customisable newsletter. 4 Make sure to confirm your registration using the link sent to your email. If you fail to locate it in your inbox, request a new link. 5 The confirmation link sent to your inbox will navigate you to a webpage where you will be able to set up your password and finalise your registration. 1 Click on your user name to access your profile and account settings. 2 Use Account settings to change your password and/or email address; deactivate your account; and view your API key. 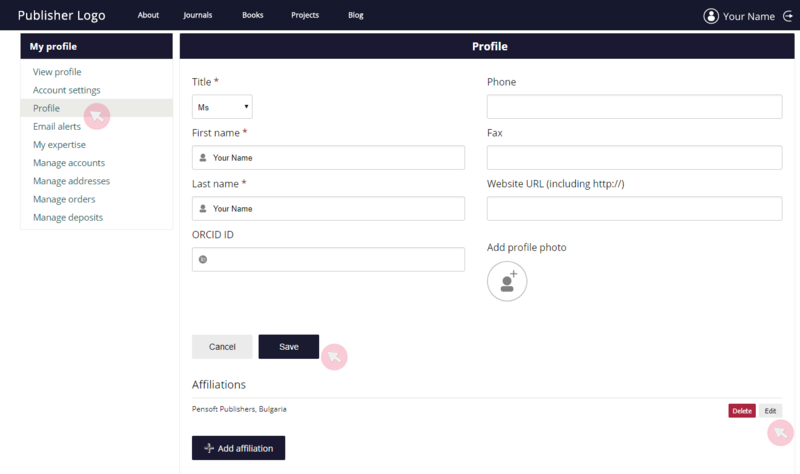 3 Edit your personal information and affiliations via Profile. 4 To edit your newsletter subscription, go to Email alerts. 5 Use My expertise to set your expertise. This information might be used to avoid peer review invitations in scientific areas which lie outside a reviewer’s competence. Either type in your expertise in the box or use the hierarchical tree to select it. Use the plus (+) symbol on the left-hand side to access the subcategories, if available. Note 1: We strongly recommend that you select the lowest possible categories in your areas of expertise. Note 2: If you are invited to join the Editorial board, your expertise as a Subject editor (SE) may differ from the one that you have set as your expertise. It is the Editor-in-Chief who has the responsibility for setting and updating your SE expertise. In case you have multiple registrations with ARPHA, you are strongly recommended to merge your accounts, along with their user rights and tasks. 1 Make sure you have logged in to the account you wish to set as primary. 2 Click on your user name to access your profile and account settings. 3 Go to the Manage accounts tab and type in the email address(es) used for the registration of your other account(s). Click Add. 4 A confirmation link will be sent to the secondary email address(es) in order to authorise and finalise the operation. 5 Once your accounts have been successfully merged, you will receive your notifications on the email address set as primary. Please contact our support team if you experience problems with merging your accounts. 2 Use the Account settings tab to deactivate your account. 3 After you agree to the terms and click Deactivate, you will need to confirm your account deactivation using the link that will be sent to your email. Note 1: Your name, affiliation and contact details will be still showing in articles you have authored / reviewed / edited even after you have deactivated your user account. Note 2: Both published and archived articles you have authored / reviewed / edited will remain in the system after you have deactivated your user account. 1 Once you have logged in to your account, you will be able to see and use the My tasks button in the header of the journal’s website. 2 Go to My tasks* to access your user dashboard. There you will find all manuscripts you are working on (authoring, co-authoring, reviewing, editing). *The My tasks button will not be visible until you have submitted a manuscript or been assigned a task. 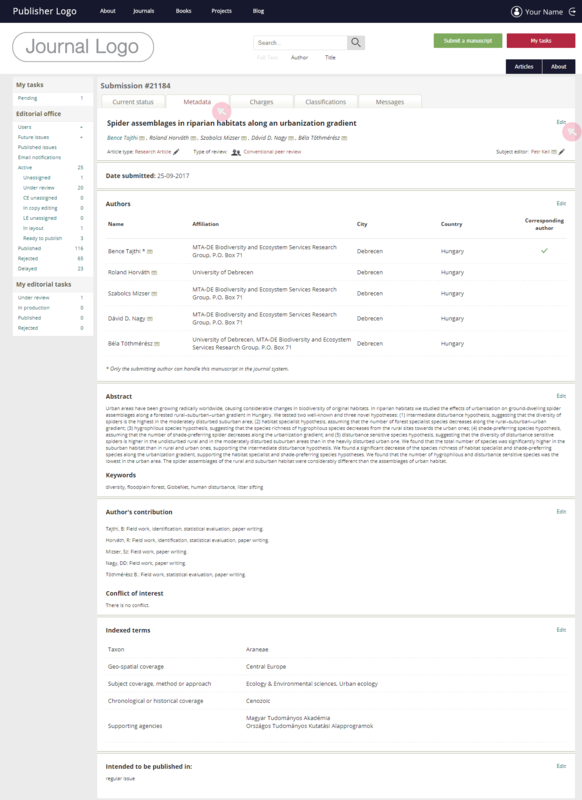 Note: If you have been assigned with a specific journal role or granted extra user rights, you will be able to see corresponding tabs and menus, so that you can act as either a Journal manager, Editor-in-Chief, Subject editor, Author or Reviewer. 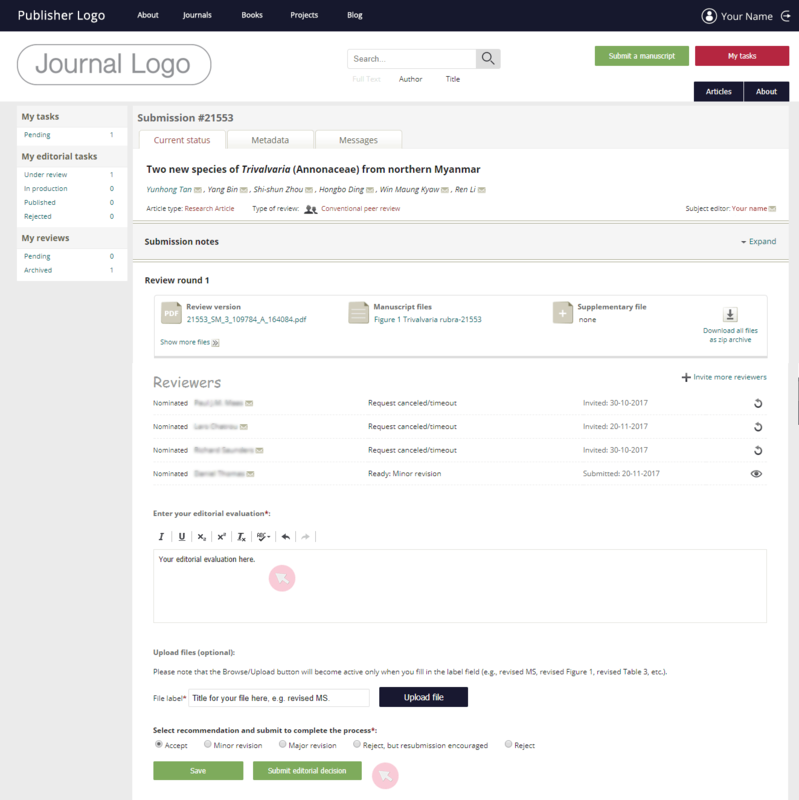 Once logged in to your account, click the Submit a manuscript button in the header of the journal’s website to launch the manuscript submission interface. For full instructions on how to prepare and submit a manuscript, see the Author Guidelines section at any journal’s website or the Author chapter in the present manual. 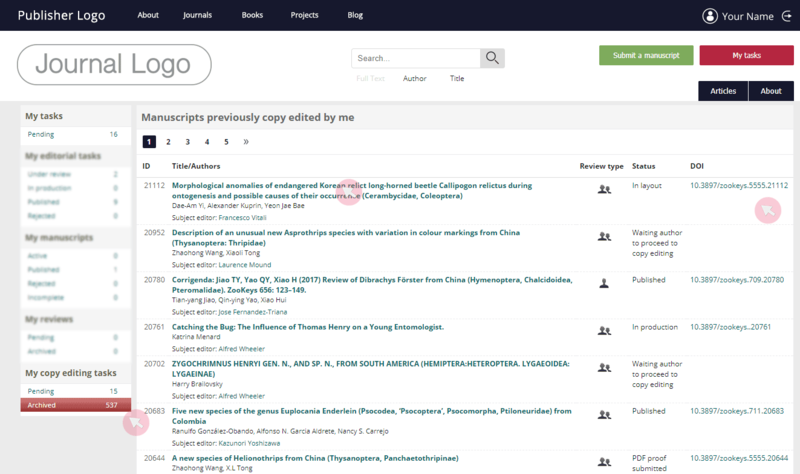 1 Find your manuscripts in the My manuscripts menu grouped by their status (Active, Published, Rejected and Incomplete). To browse through the manuscripts, click a status group to see the full list. The figure next to each category indicates the number of manuscripts in it. 2 Browse the list using any filter. Filter out manuscripts by their issue or a type of details available in the drop-down list in the second field. Note: Make sure to fill in the number / text in the leftmost field according to the criteria you have set in the middle field (e.g. type in the name of the author in the leftmost field only after you have selected Author in the middle one). 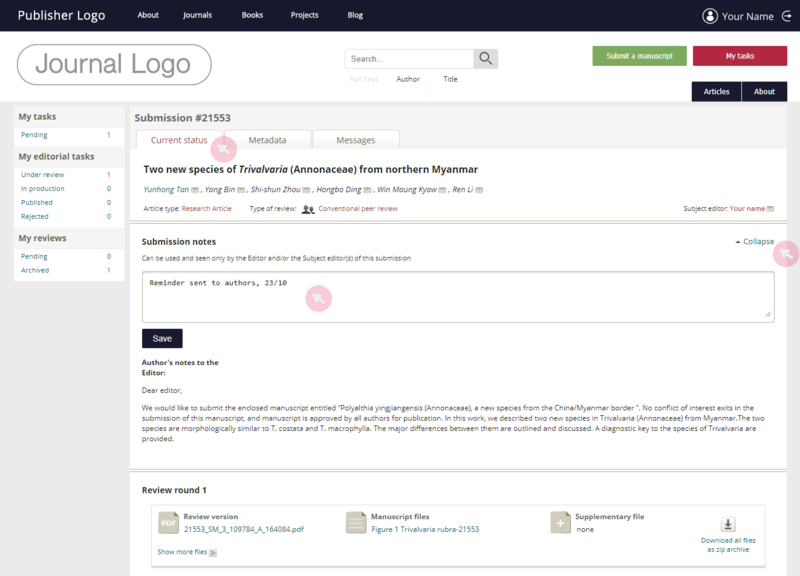 3 To access a submission, click on the manuscript title. ARPHA uses a number of clickable objects (i.e. symbols and texts). To identify a clickable object, your mouse arrow ( ) will turn into a hand cursor ( ). 1 Often the clickable text is self-explanatory enough (e.g. appears under a column entitled Actions or reads Assign). 2 To find the use of a certain clickable object, hold the mouse pointer over it for a moment to see a brief explanation. The clickable next to a user’s name generates an email to that person. * Alternatively, right click the icon ( ) to copy the email address. (Note that the recipient will receive the email from your email address which has been added to your user account). The allows for edits. Hover over the symbol to find out what edits can be done for the particular occasion. The downloads files to your device. 1 Once you have accessed the article, go to the Comment section and click the Review it button to leave your comment in the text box. 2 Leave your comment in the text box provided. Optionally, you can open and fill in the the Review form. 3 When ready, use the Post button to publish your comment. Note: Your comment, review form and name will be publicly available. 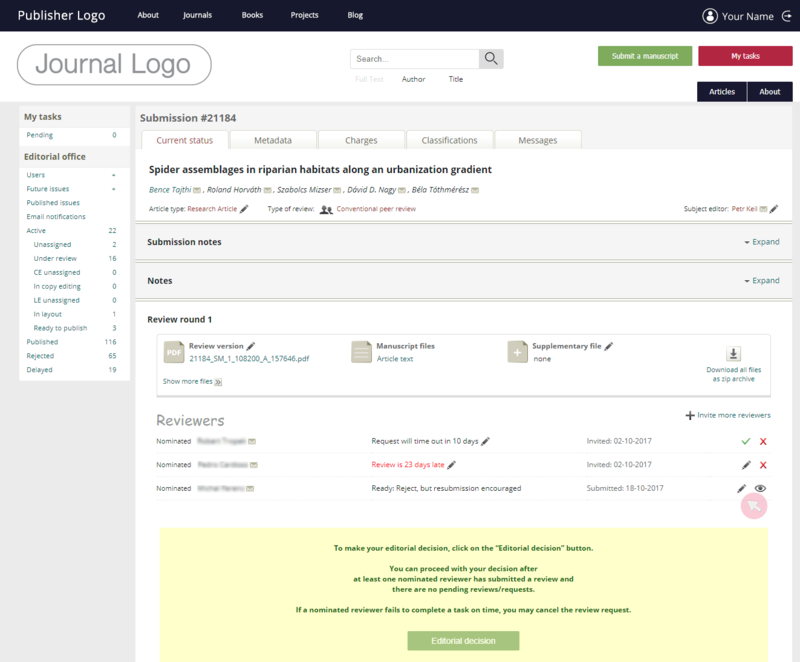 Manages the setup, workflows, information pages, notification emails, article processing charges and other journal-level features of a particular journal. 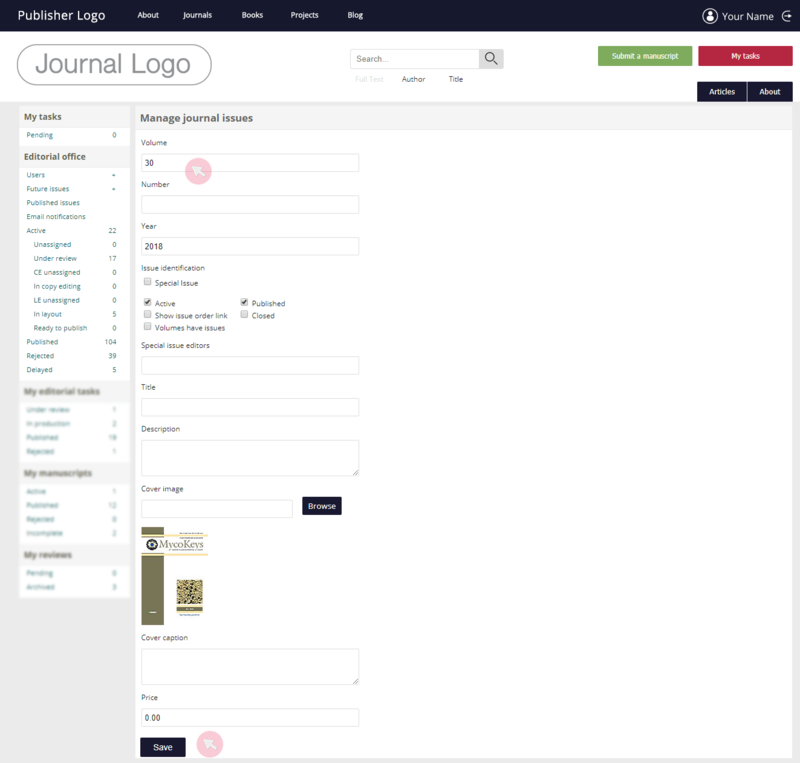 1 Access and manage the pages and sub-pages in the About section of the journal from About pages in the Journal setup menu. 2 Click the plus (+) symbol on the About pages tab to add a new page. Menu short title: page title visible in the About section menu used as an anchor within the menu. moves the (sub-)page up / down the order (click the corresponding arrow). 5 To access and edit the text of a (sub-)page, click the specific (sub-)page. 6 To copy-paste a (sub-)page from another ARPHA journal tick Use existing. 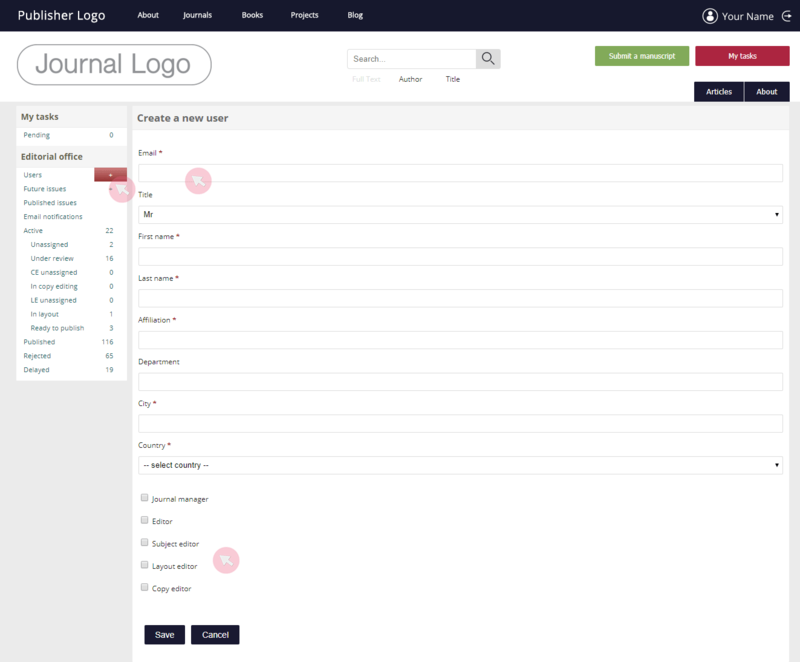 Additional fields will appear to let you select the journal and its (sub-)page you want to copy. Note: The application of Use existing does not allow you to modify the text. It simply copy-pastes it as it is. An error or a typing mistake can only be corrected at the journal for which it was initially set. Likewise, if the content of the original page changes, these edits will influence any copy-pasted pages. 7 Tick Add to sidebar to make the (sub-)page visible on the journal’s homepage. 8 Tick Show in About to make it visible in the journal’s About section. 9 Click Save to finalise your edits. 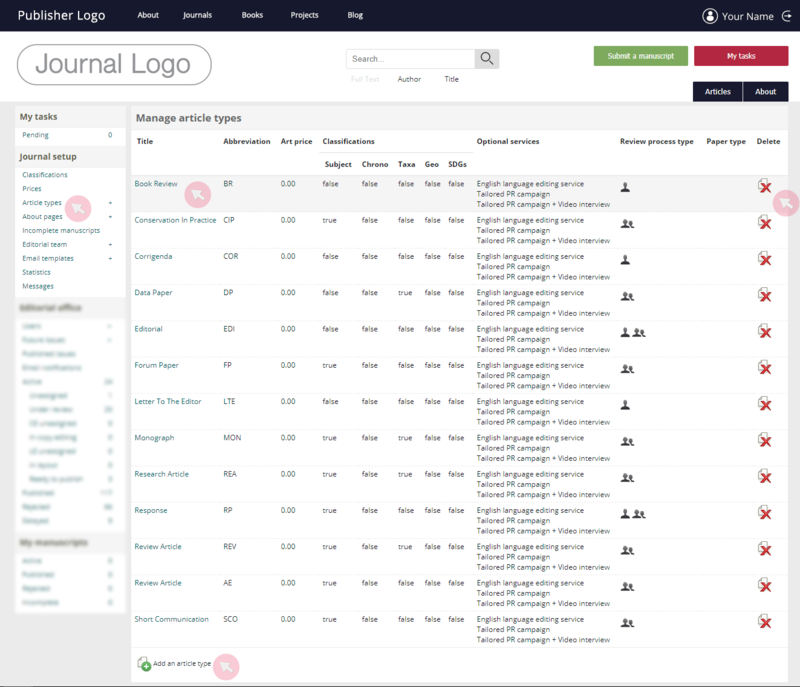 Journal managers can edit the Editorial board and the Contacts lists visible as separate tabs on the homepage of the journal. 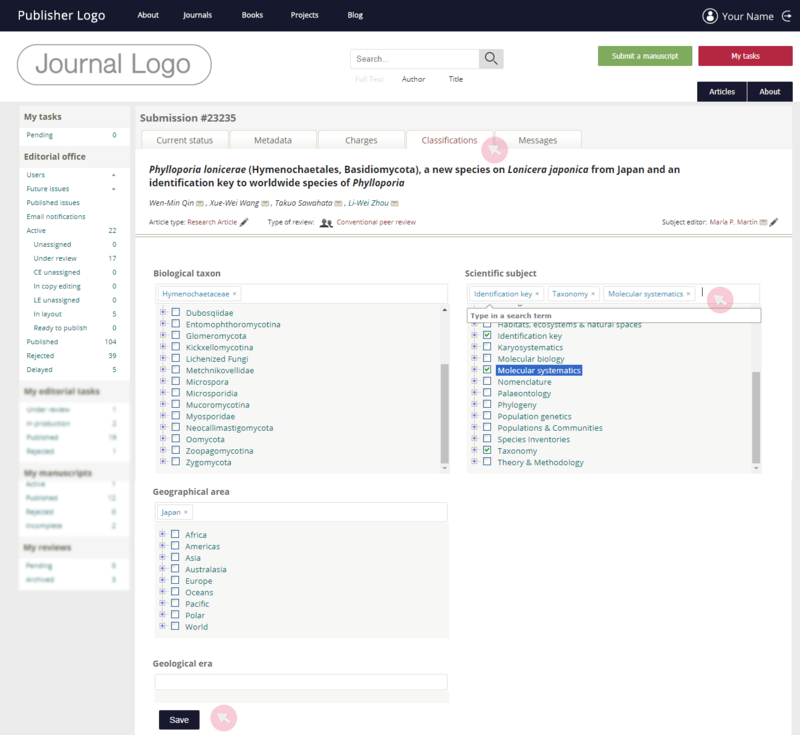 1 Use the Editorial team tab from the Journal setup menu to access and edit the lists. 2 Click Edit to update the corresponding list. To add a new user, type in his name or email and click Add to list. If you fail to find him/her in the database, create a new user. To update a user’s role, type in the corresponding box and click Update to save the changes. 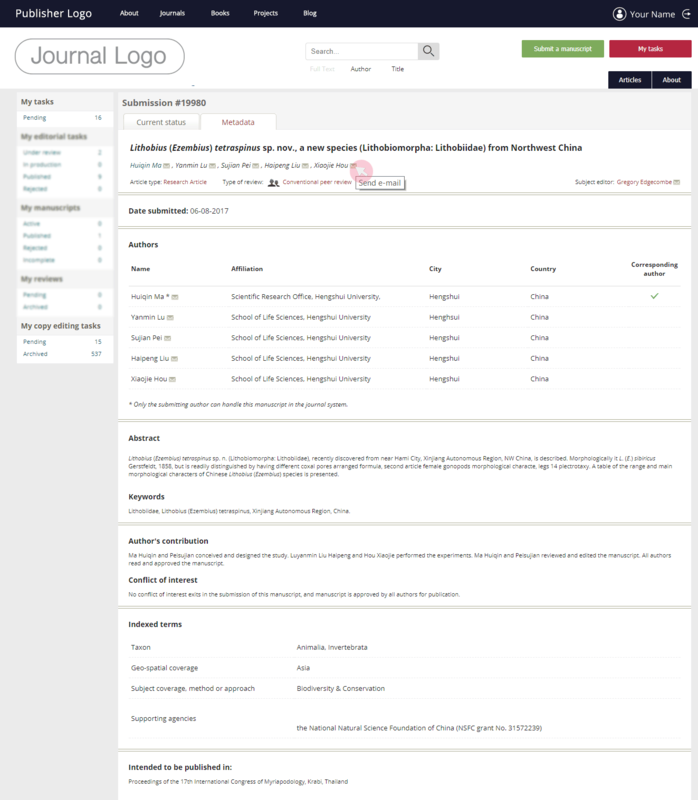 1 To access manuscripts, which have been created for the journal, but have not been successfully submitted, go to the Incomplete manuscripts tab in the Journal setup menu. Note: Incomplete manuscripts are often submission forms left blank. 2 To delete an incomplete submission, use the command on the right-hand side. 3 To access the submission on behalf of the submitting author, click on the manuscript’s title. 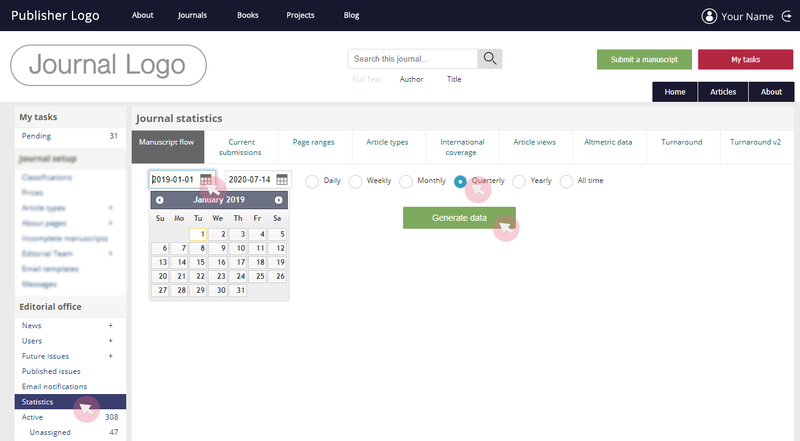 Use Statistics from the Journal setup menu to access various statistics data (e.g. the count of submitted manuscripts, published articles and submitting authors over a defined period of time). 1 Use the date icon to select the period of interest. 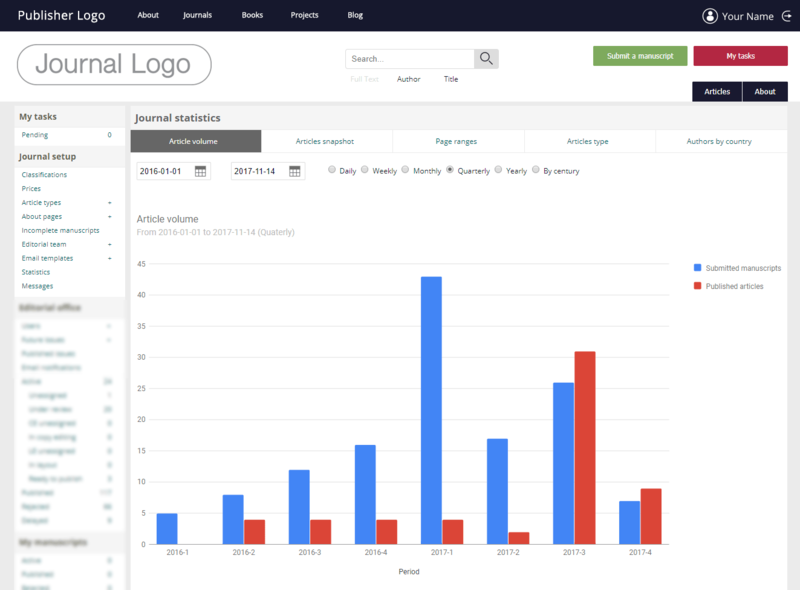 Choose whether you want to compare the data from that period by day, week etc. Retrieve the data with the Generate data button. 2 Articles volume provides information about the count of active manuscript/articles for the set period of time. They are ordered by progress status. Note: Tick a column and then click Draw graphic to see the data as a graphic for your convenience. 3 Article snapshot provides the count of active manuscript/articles for the current day. They are ordered by progress status. 4 Page ranges categorises the articles published over the selected time period based on their length in pages. 6 Authors by country keeps track of the authors who have published their manuscripts over the selected time period and orders them by home country. 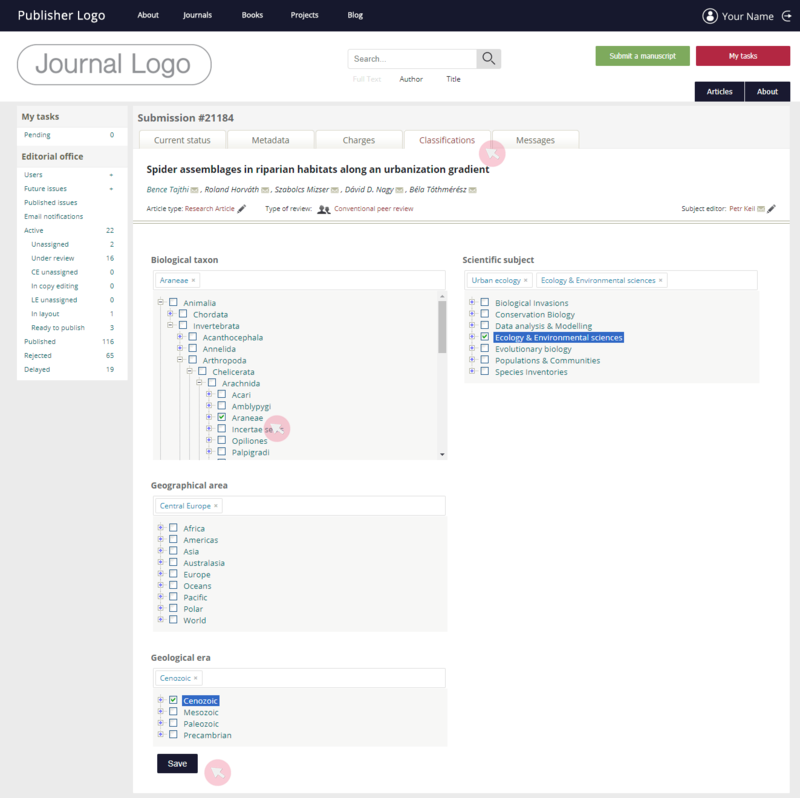 1 Use Article types from the Journal setup menu to set the article types available in the journal. 2 Click the plus (+) symbol on the Article types tab to create a new article type. 3 Click on an article type’s title to edit it. 4 Go to the far right to delete an article type and the bottom of the page to add a new one. 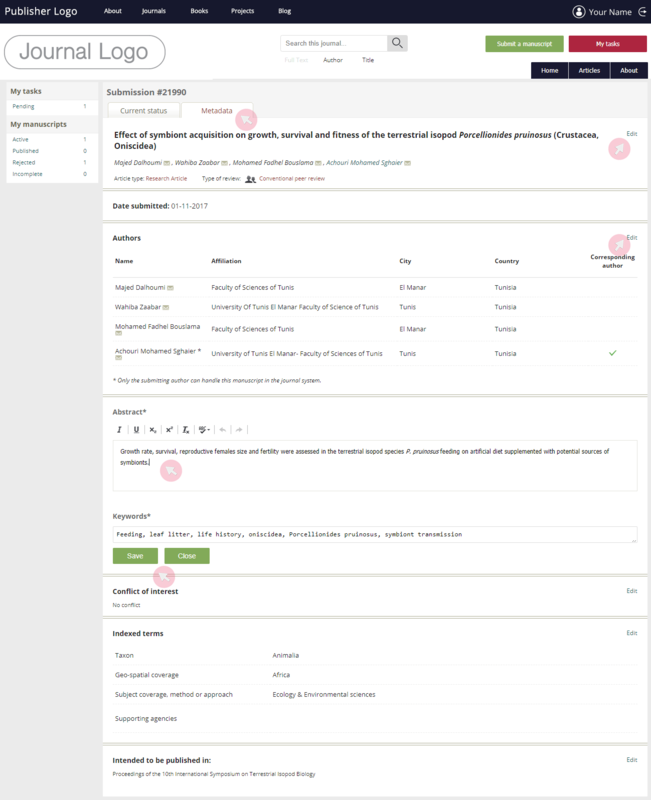 5 In the edit mode, you can change the name of an article type; set an evaluation / peer review type; add mandatory fields; set optional services etc. 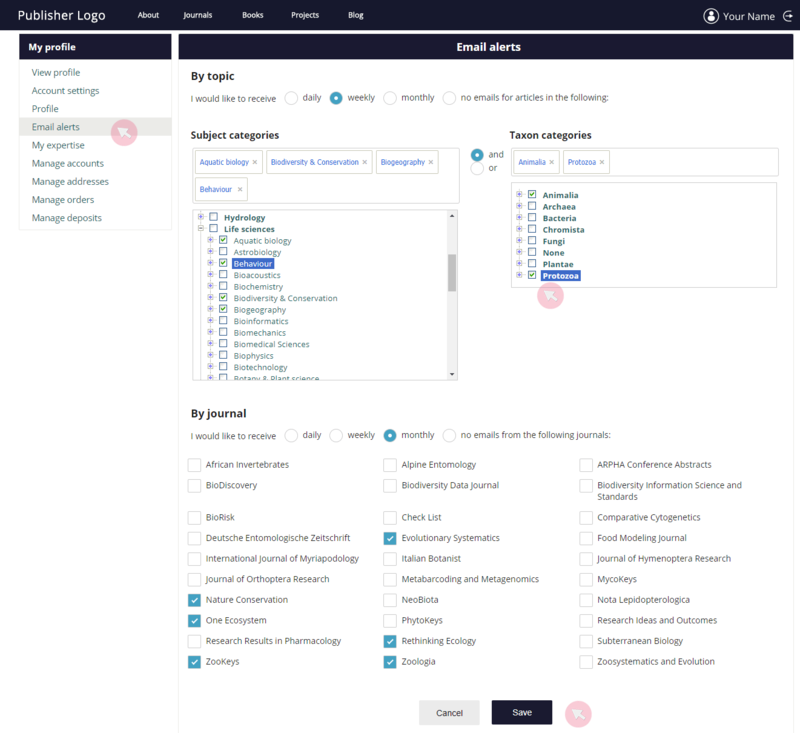 1 Use Classifications from the Journal setup menu to set the different categories to which the manuscripts can be assigned upon submission. Note: These classifications are essential since they are used when inviting suitable peer reviewers. They will be also used as tags (indexed terms) after the article is published. 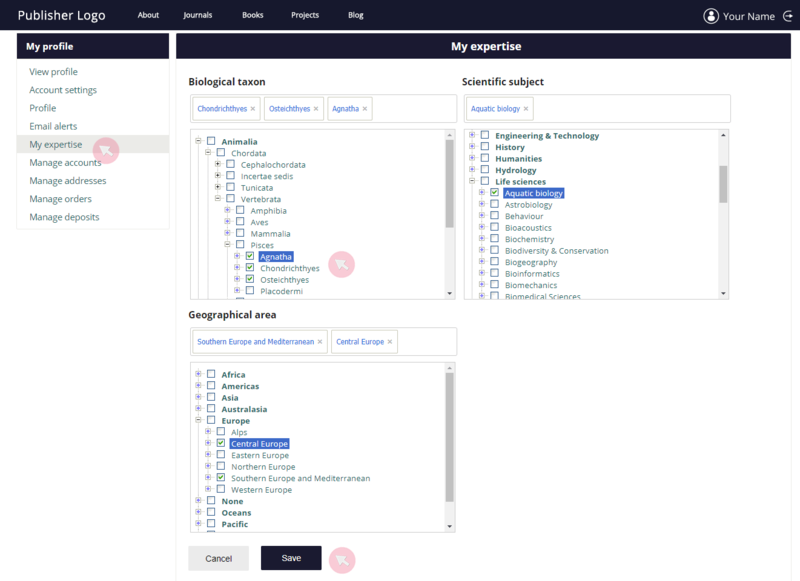 2 Tick all classifications from across the hierarchical trees which you find suitable for the journal. Select all ticks all lower categories within the main one. Likewise, Unselect all leaves only the higher category ticked. Tip: Untick a higher classifier and select only the necessary child categories within it. Thus, authors will only be able to select categories lower than the unticked one during manuscript submission. Higher precision of the assigned classifications facilitates and expedites the assignment of both subject editors and reviewers. 3 If necessary, add a new category using the actionable text at the bottom of each section. 4 Click Edit to change a category’s name or its parent ID. 5 Make sure to tick Display in this journal to confirm and finalise your edits. 1 Use Messages from the Journal setup menu to monitor the emails sent from the system to the users. Click Expand to see the full text of an email. 2 Use the filter box and date icon to search for messages of interest. The Editor-in-Chief (E-i-C) is responsible for the scientific quality and overall performance of a journal. The E-i-C participates in defining the journal’s focus, scope and policies and in the assembly of the editorial board. Furthermore, the E-i-C represents the journal to the outside world and takes care for possible resolution of conflicts between authors, reviewers and editors. The E-i-C has the right to intervene in the review and editorial process and to make final decisions over those of the Subject editors on the acceptance / rejection of manuscripts . In some journals, an E-i-C also verifies the final decision on the acceptance / rejection of manuscripts following completion of the review process and provision of a Subject editor’s opinion. The Managing editor (ME) monitors and coordinates the whole editorial process, from submission through peer review, editing, production and publication, as well as other services available. 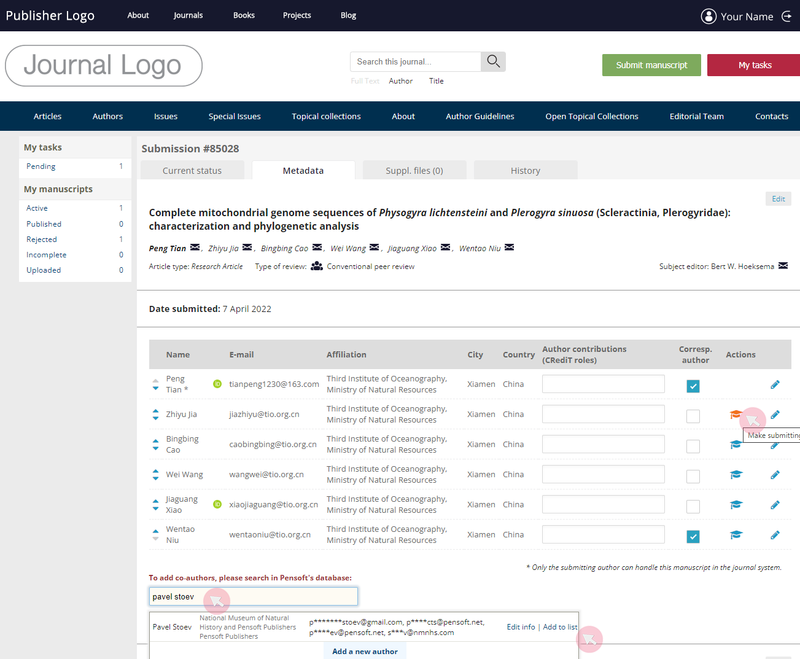 The ME can also manage users and user rights, provide manuscript screening prior to peer review and assign subject editors. The ME is responsible for the communication between the different actors in the publishing process. 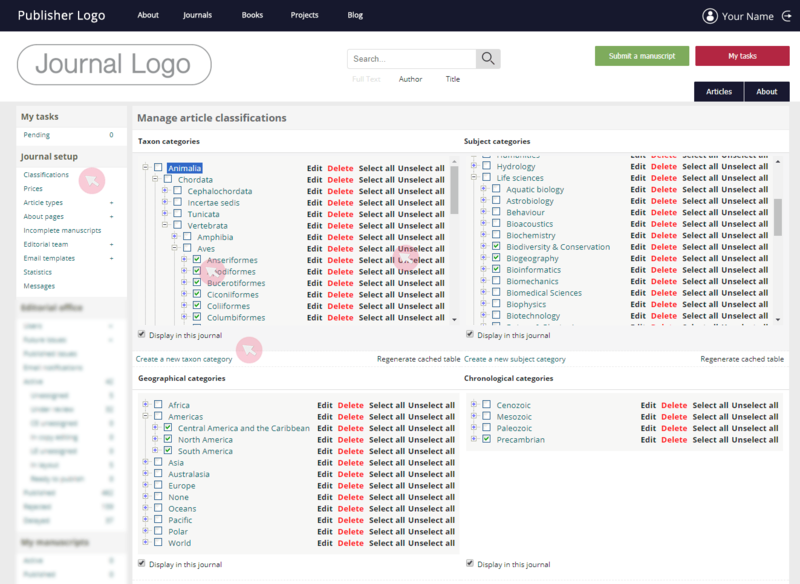 In ARPHA, the user rights of the Managing editor and the Editor-in-Chief overlap. Therefore, for the purposes of the system and these guidelines, they are both referred to as Editor (E). It is a matter of agreement between the Editor-in-Chief and the Managing editor to define their responsibilities in managing the journal, using the same access and user rights. 1 Before creating a new account, check whether a person is already registered with ARPHA. Go to the Users tab from the Editorial office menu to search for him/her by typing in a name or email address and clicking Filter. 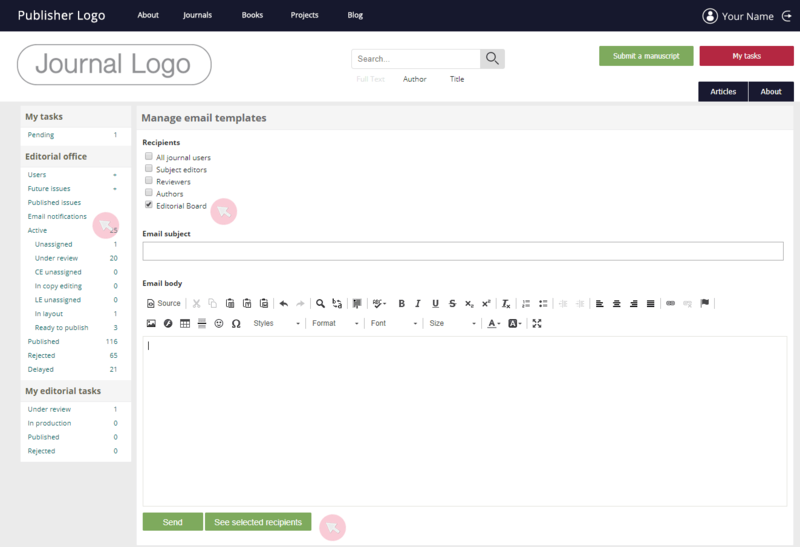 2 To create a new user account, click the plus (+) symbol on the Users tab from the Editorial office menu. Complete the form by ensuring that all mandatory fields (marked with *) are filled in. 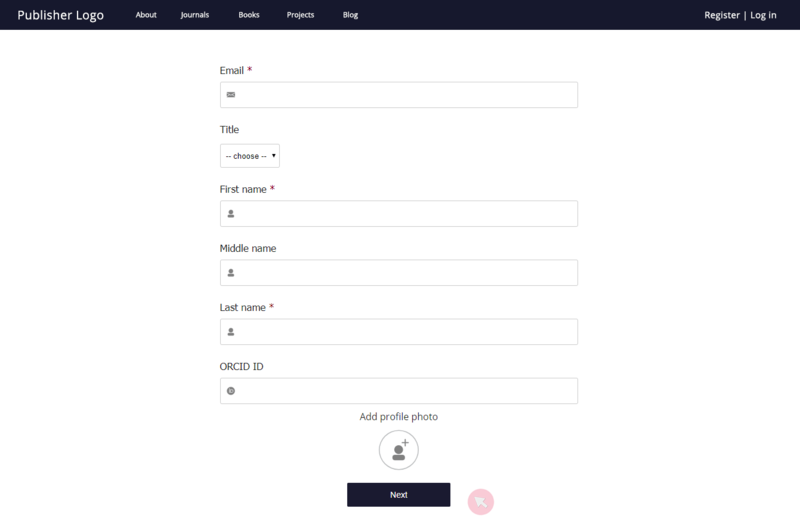 Use the form to also assign a role to the new user where necessary. Note 1: If the mandatory fields fill in automatically, there is an existing account associated with this email address. Do not try to make any further updates, as the changes will not be saved. If you still need to make an update, contact the Editorial office. Note 2: These details will appear on the journal’s website. Depending on the role, the user might be added to the Editorial board / Subject editors list along with his/her personal details. 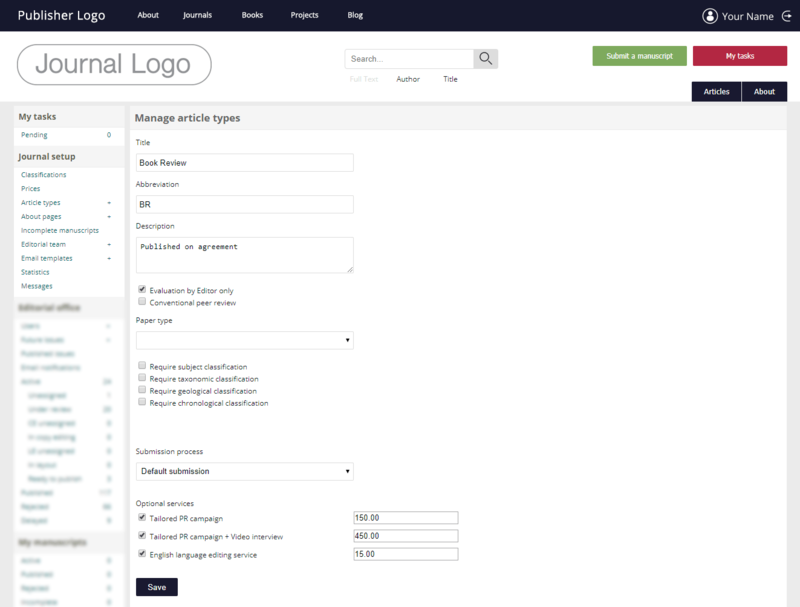 Click on Users from the Editorial office menu to access all registered users. To search for a user, type in his/her name or email address and click Filter. 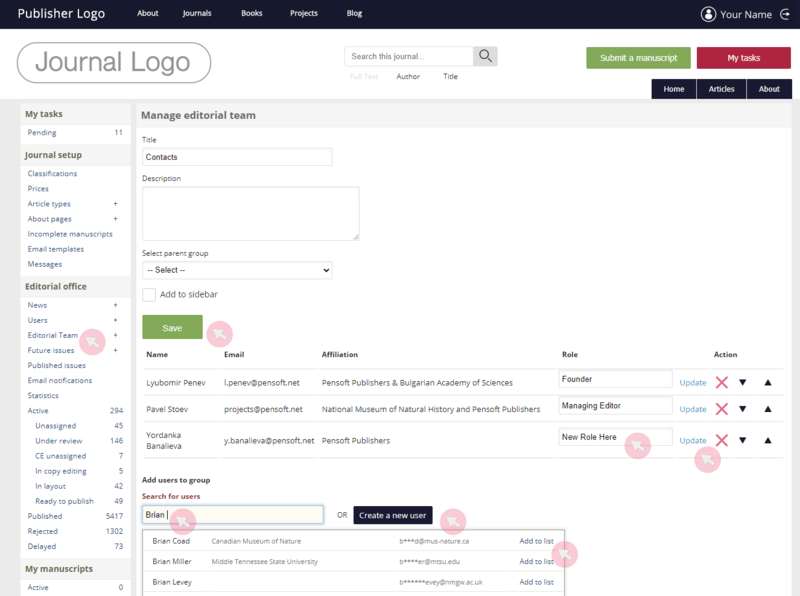 1 Click on Users in the Editorial office menu to access all registered users. 2 Type in the name or email address of the user you want to grant with specific user rights and click Filter. 3 Tick the box(es) corresponding to the user rights you want to grant him/her (JM – Journal manager; E – editor; LE – Layout editor; CE – Copy editor) and click Update to confirm and save the new settings. Likewise, untick a box and click Update to remove a user’s specific rights. 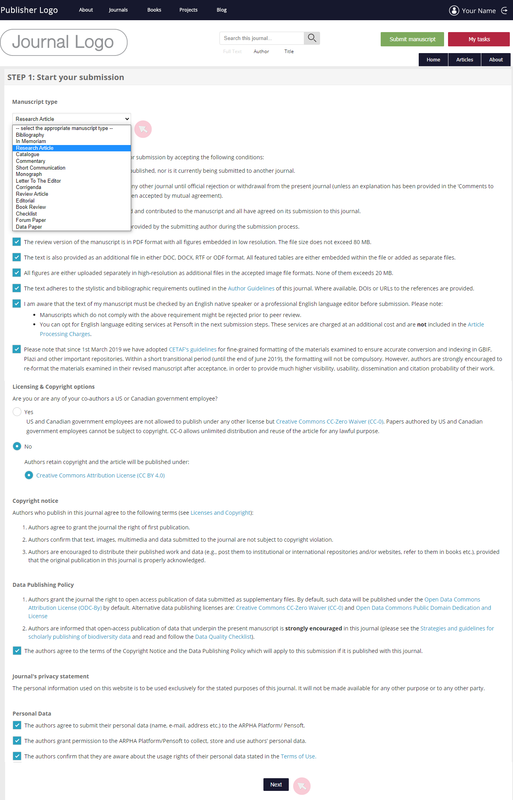 4 Use the clickable Expertise that appears whenever you assign SE rights to a user to select the scientific areas for which a particular SE will take responsibility. We strongly recommend that you select the lowest category possible (e.g. family or order for biodiversity-themed journals) when selecting a SE’s expertise. Note 1: The SE’s expertise can only be set and updated by the E. This expertise may differ from the one set by the user in his/her profile. 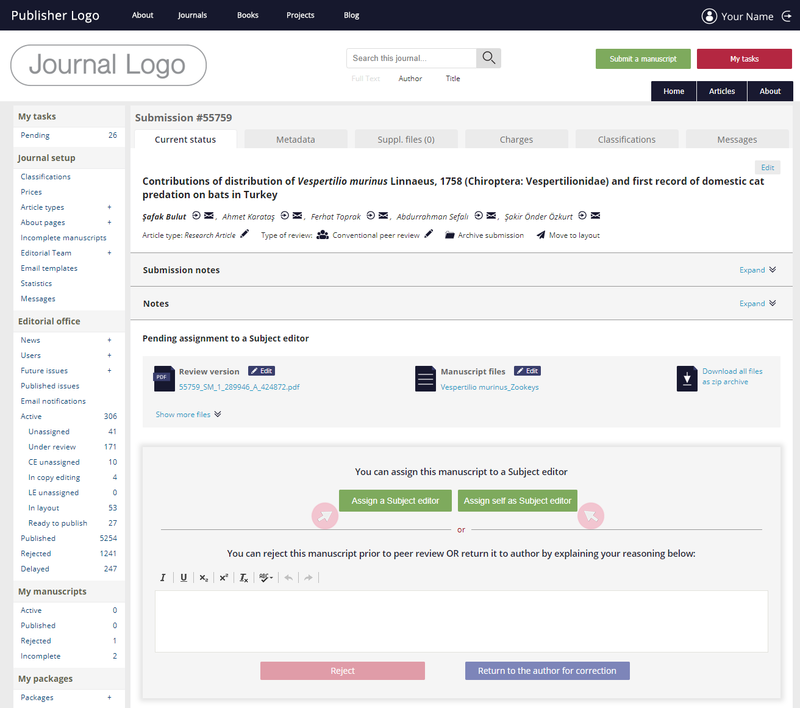 The user’s expertise as a SE is the one that will be displayed on the journal’s website. These categories will be also used by the system when suggesting a suitable SE for a particular manuscript. Note 2: Depending on his/her role, the user might be added to the Editorial board / Subject editors list along with his/her personal details. 2 Type a user’s name in the field to filter out a specific user and his/her multiple accounts. Use the Merge box to tick all accounts intended for merging. 3 Select one of the accounts as a Primary user by ticking the corresponding box. 4 Click the Merge selected users button to confirm and save the new settings. 5 Once the operation is authenticated, the email address associated with the primary user account will be used for all correspondence that the user receives via the ARPHA system. It will also appear anywhere in the system when needed (e.g. user listed as Corresponding author in a published article). Note 1: Merging a user’s separate accounts also merges his/her user rights and roles, tasks etc. Please be aware that merging the wrong accounts will lead to permanent loss of personal information associated with the secondary account(s). Note 2: If that user has different profile photos, the system will set the one from the primary account. 2 Filter out the user to whom you need to log in by typing in the user’s name in the box and clicking Filter. 3 Right click on Log in as on the right-hand side. Open the link in incognito window (otherwise you will log out of your own account). Note: While logged in as a third party user, you will be able to access only the dashboards and tasks available for that user’s role in the particular journal. 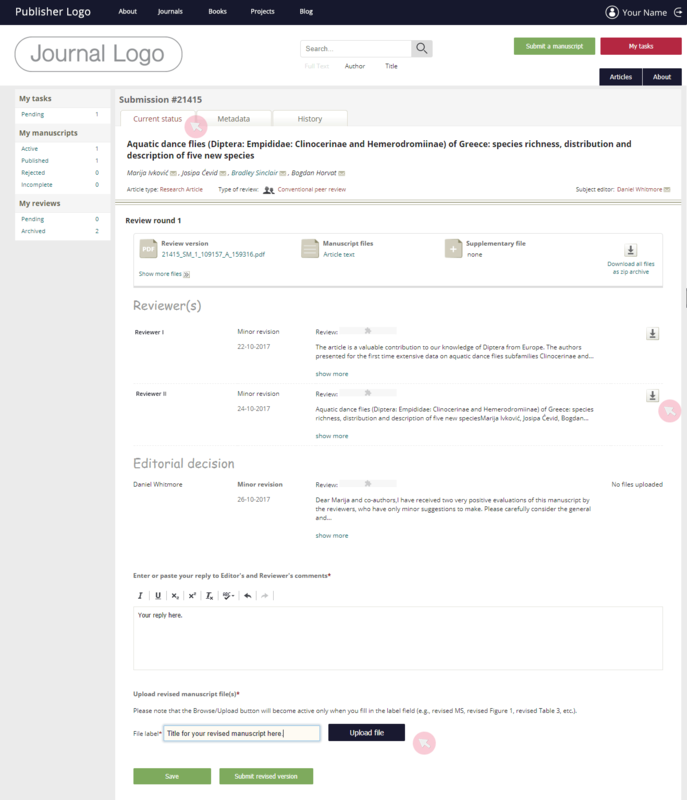 The Editor (E) can access and edit peer reviews on behalf of reviewers by either using his/her own account or logging with a reviewer’s account. To submit a review on behalf of the reviewer, the E needs to log in to the reviewer’s account. 1 Locate the manuscript from Under review (or Active) in the Editorial office menu. Access the submission by clicking on its title. 2 Find the Reviewers list and use the at the rightmost side to edit his/her review prior to its submission (the is visible only when a reviewer has accepted his/her peer review invitation). 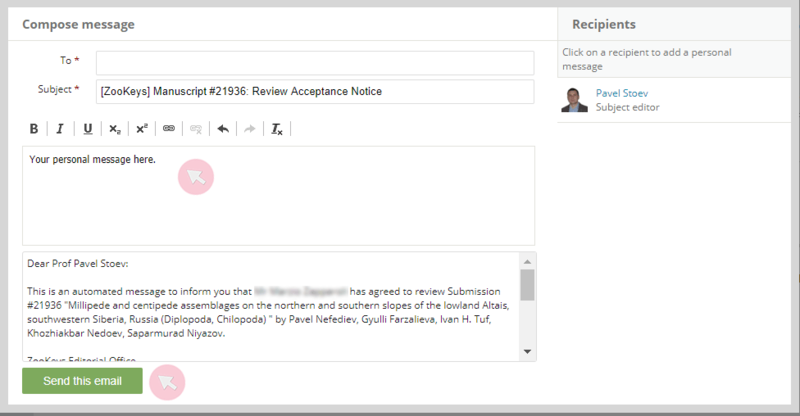 Note: You can also accept/decline a review invitation on behalf of the user using the clickable and respectively. 3 Edit or complete the form in the newly appearing pop-up window. Use the Save button at the bottom to save your edits. Note: For more information about how to complete the peer review form in ARPHA, see the Reviewers chapter in this manual. 1 Locate the reviewer from the Users tab in the Editorial office menu. Log in to the reviewer’s account by right-clicking on the Log in as command. 2 Once logged in to the reviewer’s account, access his/her manuscripts assigned for peer review from Pending in the My reviews menu. Click on the title of the submission to access it. 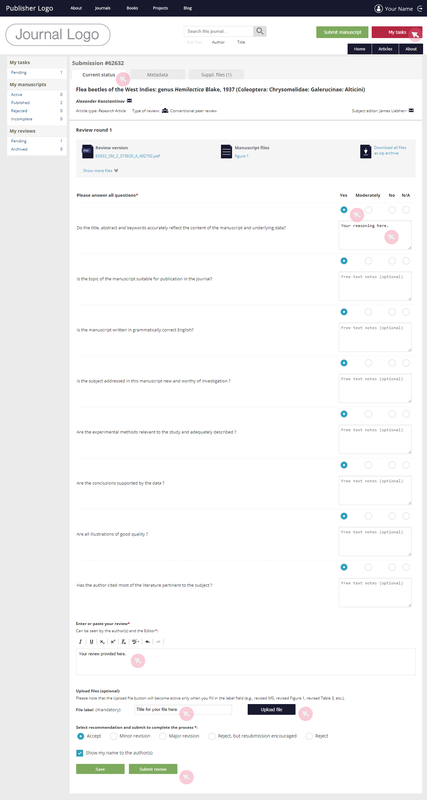 3 To complete the peer review submission, make sure to answer all mandatory questions (marked with *). 4 Use the buttons at the bottom to either submit the peer review on behalf of the assigned reviewer or save it as a draft. 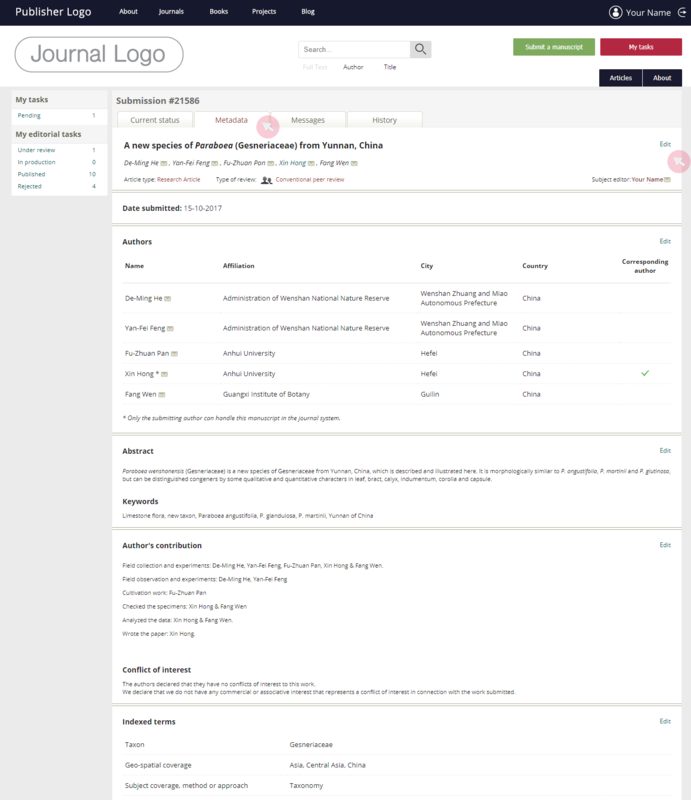 1 Access all Active, Published, Rejected and Delayed manuscripts via the Editorial office menu. For further convenience, the active submissions are split into several categories depending on their current status. 2 To access the respective submission, click on the manuscript title. re-assign the paper to a different journal issue. *As you type in a user’s name or email, a drop-down list of ARPHA-registered users matching the searched text string will appear. If the user you are searching for is present in the system, click Add to list. If not, use the Add a new author button at the bottom of the list to create a new user and mark him/her as a co-author of a manuscript. 5 The Charges tab provides details on the journal’s policies on APCs and payment options, including available discount / waiver conditions and the person responsible for remitting the APCs for the optional services. 6 The Classifications tab provides various categories assigned to the manuscript by the authors upon submission. Pay particular attention to these as they serve to filter out potential SEs and/or reviewers. In case the categories are imprecise or misleading, modify the list using the check boxes. Access the sub-categories by clicking the plus (+) symbol on the left-hand side of each higher category. 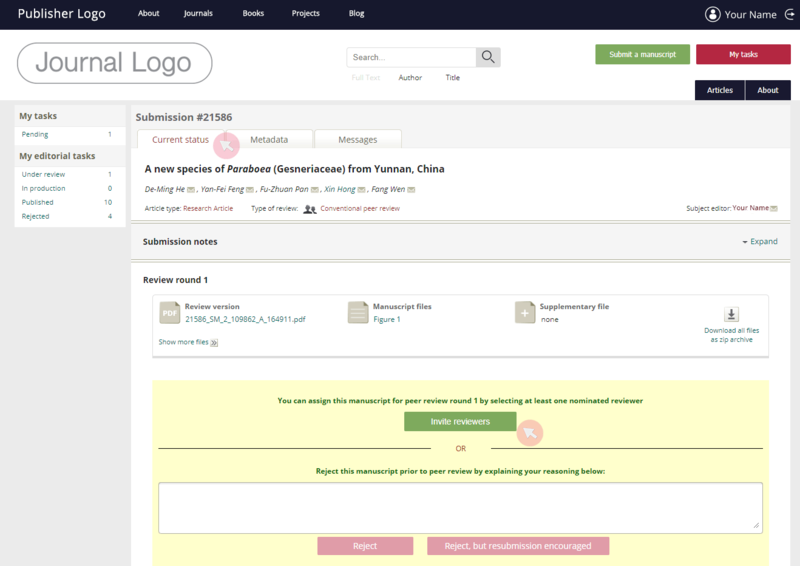 7 The Messages tab contains all messages generated by the system and emailed to the submitting author, SE(s) and reviewers. The Messages function allows you to keep track of the automatically sent reminders. To see the content of a message, click Expand. Note: By default, the system is set to send the first automated reminder on the first day a submission is overdue and the second notification - on the third. These settings can be modified according to the journal’s policies. Following a successful pre-review evaluation (performed by the journal’s Editor-in-Chief, Managing editor or the Editorial office), a manuscript is ready to undergo peer review. It is the responsibility of the E to assign a SE for each manuscript. 1 To assign a SE, find the submission in either Unassigned or Active in the Editorial office menu. Click on its title to access the submission. 2 You can assign yourself as a SE (if the manuscript falls into your area of expertise) or select an appropriate SE from the list of editors. 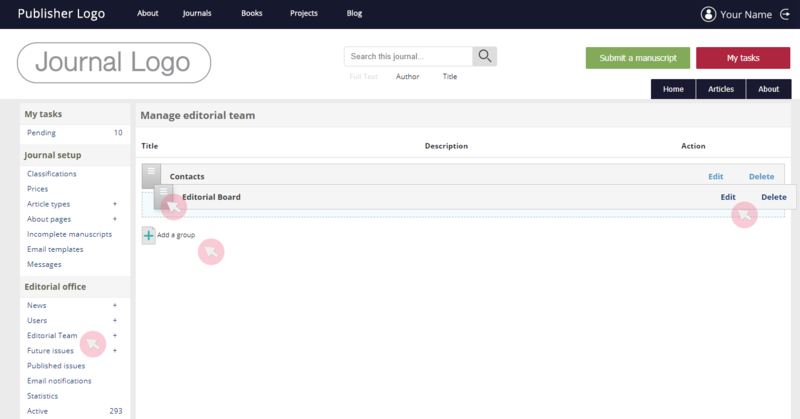 3 If you have assigned yourself as a SE, you will now be able to find the manuscript in the My editorial tasks menu. 4 To select a SE, use the list of suitable SEs. The list is configured based on the classifications assigned to the manuscript (e.g. geo-spatial coverage, subject coverage). You can also use the search box to find a particular user by typing in his/her name. Note: You are strongly recommended to first check/correct the classifications assigned to the manuscript (using the Classifications tab as explained in Manage submissions and monitor their progress above) to ensure the system suggests the most suitable users. 5 To change a SE of a submission while it is under review, find the manuscript in either Active or Under review and access its submission. Use the to assign a new SE (see above). After a manuscript is accepted for publication, it can proceed to copy editing (if necessary). It is the responsibility of the E to assign a Copy editor (CE) for each manuscript. 1 To assign a CE, find the submission in either CE Unassigned or Active in the Editorial office menu. Click on its title to access the submission. 2 In the Current status tab, scroll down and use the clickable Assign a Copy editor to access the list of registered users with CE rights. 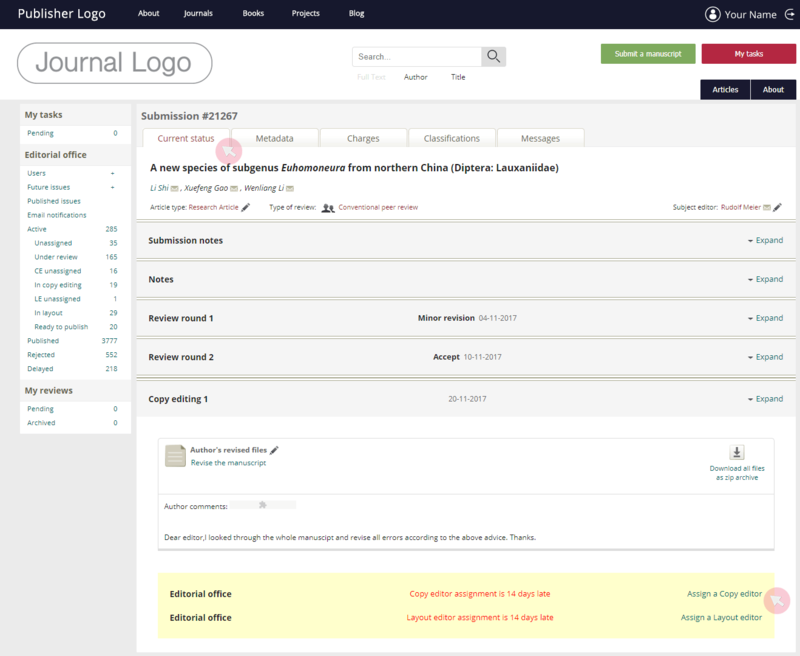 3 Click on Assign across a user’s name to assign him/her as a CE of the manuscript. A pop-up window will appear to let you add a personalised message to the automated email notification. 4 To change a CE, find the manuscript in In copy editing or Active. In the Current status tab, scroll down and click Change Copy editor to access the list of registered users with CE rights. Note: A pop-up window will appear to let you add a personalised message to the automated email notification meant for each user. Click on the user’s name on the right-hand side to navigate to the message generated for him/her. After a manuscript is accepted for publication and undergone copy editing (if applicable), it is ready to proceed to the production (layout) stage. It is the responsibility of the E to assign a Layout editor (LE) for each manuscript. 1 To assign a LE, find the submission in either LE Unassigned or Active in the Editorial office menu. Click on its title to access the submission. 2 In the Current status tab, scroll down and use the clickable Assign a Layout editor to access the list of registered users with LE rights. 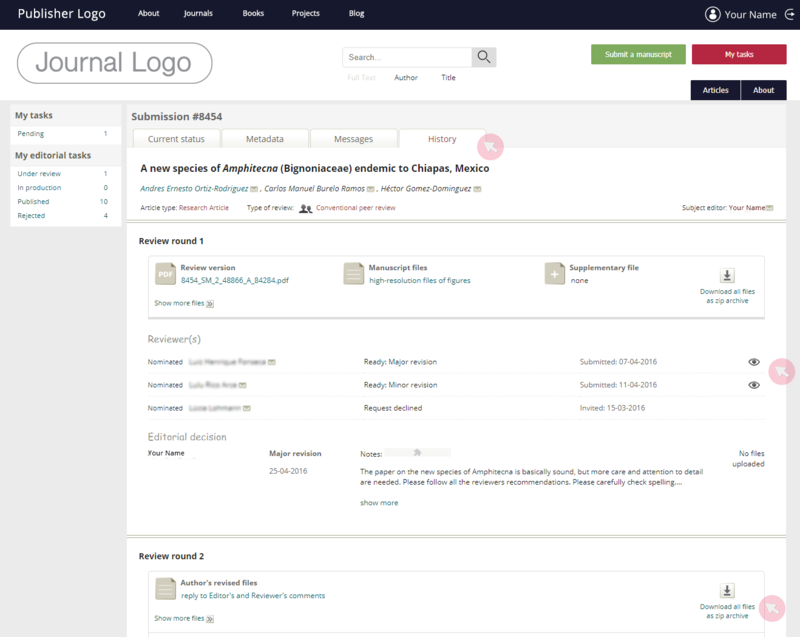 3 Click on Assign across a user’s name to assign him/her as a LE of the manuscript. A pop-up window will appear to let you add a personalised message to the automated email notification. 4 To change a LE, find the manuscript in In layout or Active. In the Current status tab, scroll down and click Change Layout editor to access the list of registered users with LE rights. In case the Editor finds it necessary, he/she can return a manuscript to the author for corrections prior to peer review. Ordinarily, the reason would be minor technical issues, e.g. noncompliant image format or missing metadata. 1 Find the submission in Unassigned or Active from the Editorial office menu. Click on the submission’s title to access it and go to the Current status tab. Note: A manuscript returned for corrections remains accessible from the Active tab, but will not appear in the Unassigned category until the author re-submits a revised version. 2 Use the field to explain your reasons for returning the manuscript. Note 1: The Return to the author for correction button will become active only after you have entered your text. Note 2: You will not be able to access your text once the manuscript has been re-submitted. We strongly recommend that you copy your reasoning either in the email which the system will generate once you click the Return to the author for correction button, or copy it in Submission notes. 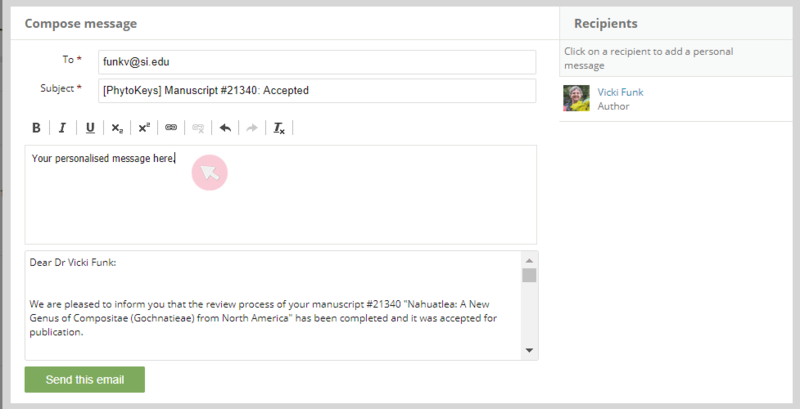 3 ARPHA will generate an email notification to inform the authors about your decision. You can add a personal message. Tip: Copy your reasoning about the return of the manuscript here for future reference. You will be then able to access your text via the Messages tab in the manuscript submission once the article is re-submitted. The Editor has the right to reject a manuscript prior to peer review if he/she finds it either of insufficient scientific / linguistic quality and/or non-conformity with the journal's scope and guidelines. 1 Find the submission in either Unassigned or Active from the Editorial office menu. Click on the submission’s title to access it and go to the Current status tab. 2 Use the text field to explain your reasons prior to rejecting the manuscript via either of the buttons at the bottom of the page. Note: Both buttons will become active only after you have explained the reasons for rejection in the text field above the buttons. 3 The system will generate a notification to the authors, informing them about your decision. They will be able to access the manuscript and see the rejection notice. 1 The SE provides a final recommendation on either the acceptance or rejection of a manuscript. 2 The SE’s recommendation is automatically emailed to the E-i-C.
3 The E-i-C can either confirm the acceptance/rejection or request further minor/major revision from the authors. 4 The SE receives an automated email notification about the E-i-C’s decision. 5 Should the manuscript be sent back to the author for revision, the revised version will be returned to the SE and will undergo the same procedure until the paper is either accepted or rejected for publication by the E-i-C.
1 Use the Future issues / Published issues tabs from the Editorial office menu to access journal issues. 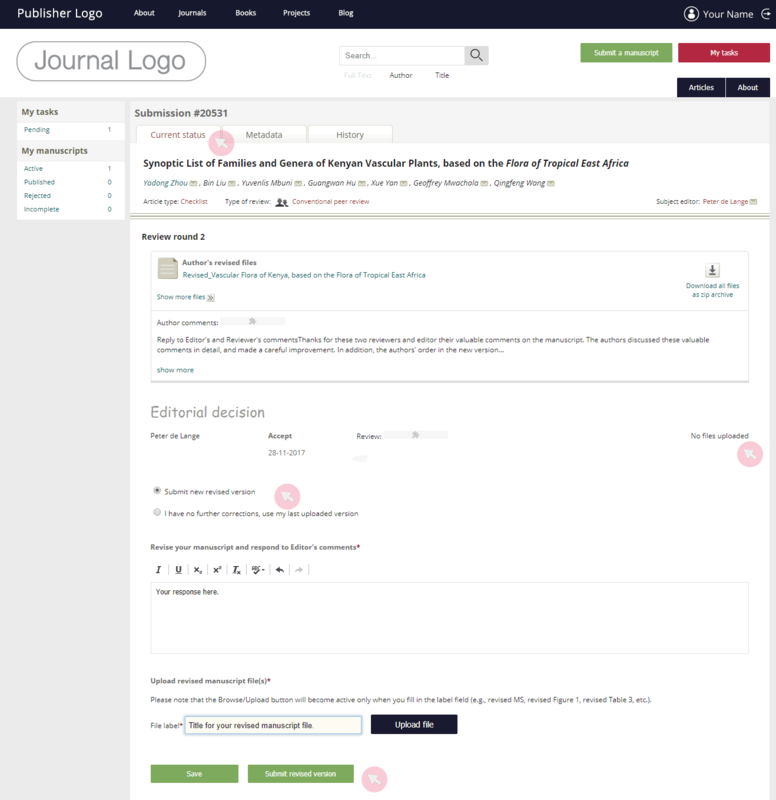 2 Use the plus (+) symbol from the tab to create a new journal issue. Note: Tick Special issue to make the issue available to authors who may wish to assign their manuscript(s) to the journal issue. 3 Find the action links on the right-hand side (Contents, Delete and Edit). 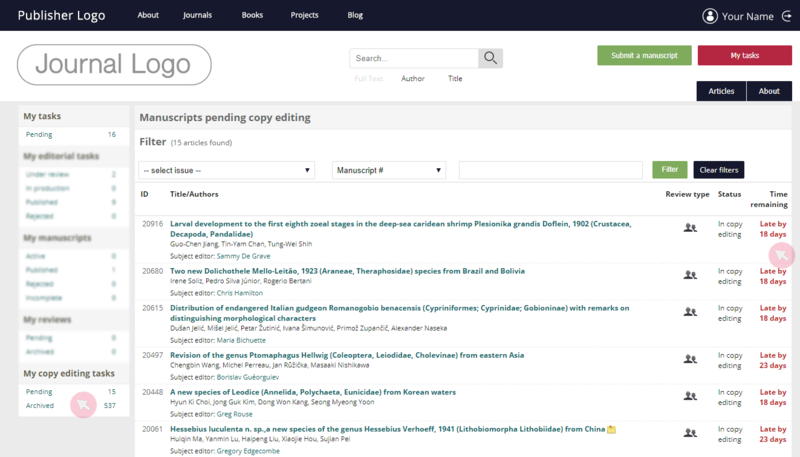 4 Go to Contents to access the list of manuscripts added to the particular issue. To move them up and down the order within the issue, use the arrows in the Order column. To discard a manuscript from an issue, click the corresponding link in the Remove column. Note that this will not delete the submission from the journal and it can be placed in another issue. Note: If you (re)move a manuscript, the page numbers visible on the right-hand side will not change automatically. You are strongly advised to avoid editing published issues. 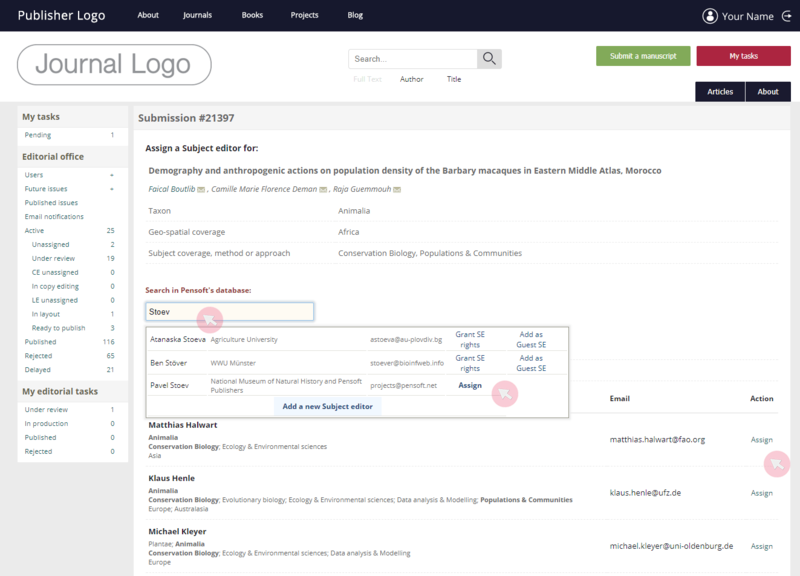 Click on the corresponding symbol in the Metadata column to update the categories assigned to the submission. Use Save to keep your edits. 5 Use Delete to discard the whole journal issue. 6 Use Edit to update the issue’s details, such as volume number, cover image etc. Click Save to keep your edits. 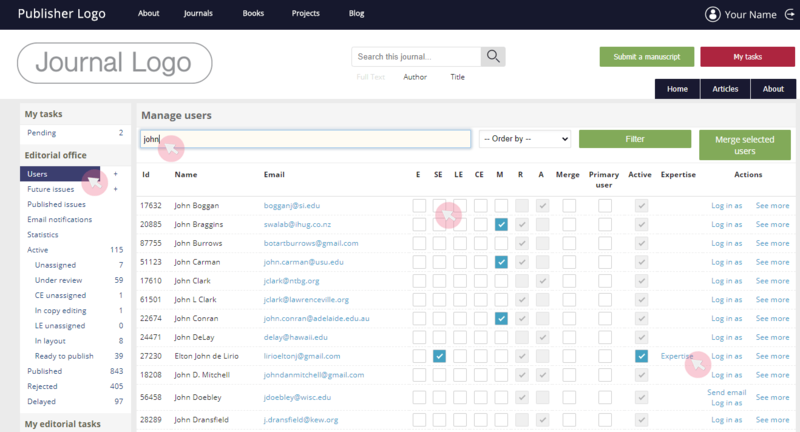 1 Use Email notification from the Editorial office menu to send an email to one or more group(s) of users (e.g. all journal users, SEs, editorial board). 2 Use the text fields available to enter the email text and subject line. 3 Click See selected recipients to access the full list of users who are to receive your email and click Send when ready. Note: You cannot add or remove recipients from a group. *Journals can opt for an alternative editorial process where the final decision on the acceptance or rejection of a manuscript lies with the Editor-in-Chief (E-i-C). In this case, the SE still provides his/her final decision, but it needs to be verified by the E-i-C.
1 Access the manuscript assigned to you along with all submission files via the automatic login link in the notification email. 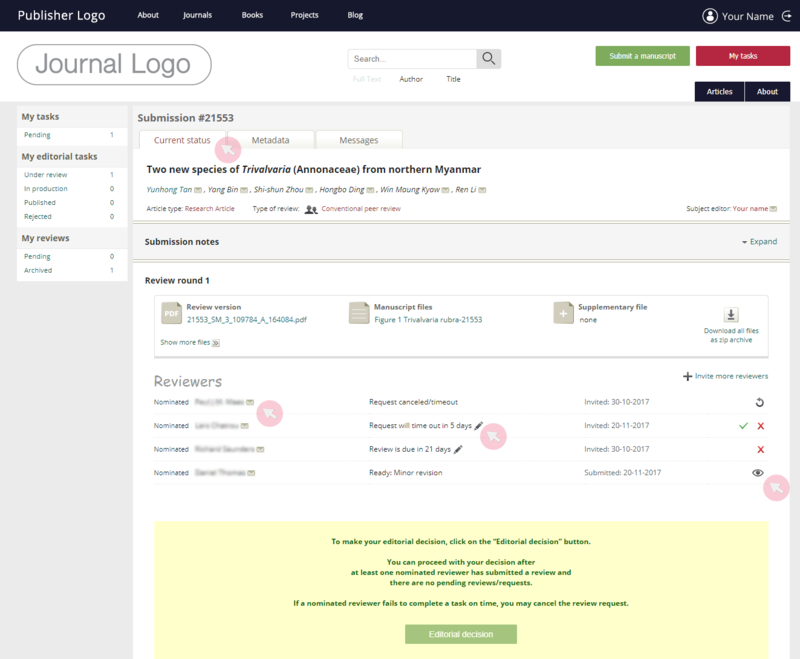 2 Alternatively, log in to your account at the journal’s website and access your dashboard (My tasks). 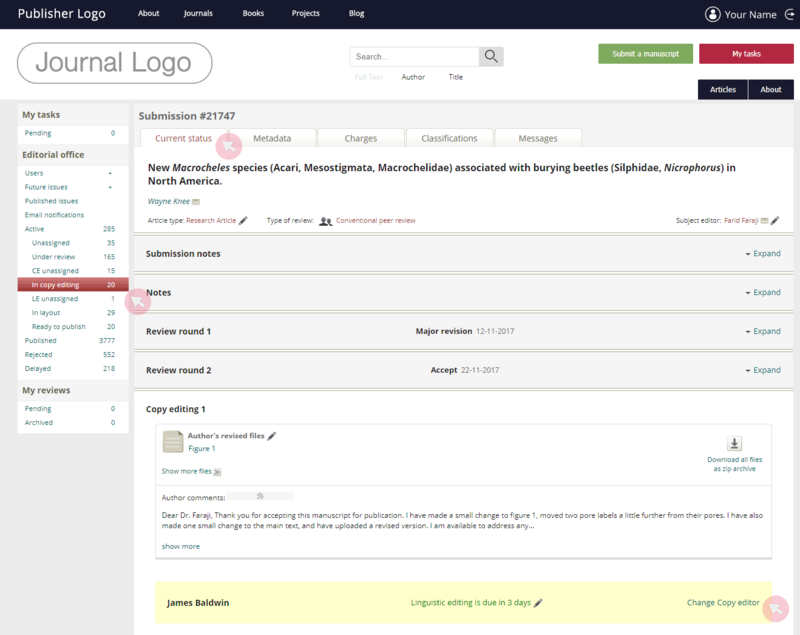 Find your assigned manuscripts in Under review in the My editorial tasks menu. Once you make an editorial decision, the manuscript will be relocated to In production. Click on the manuscript’s title to access it. 3 Use the Current status tab to access the files uploaded by the author, as well as his/her notes to the Editor and selected optional services, if any. 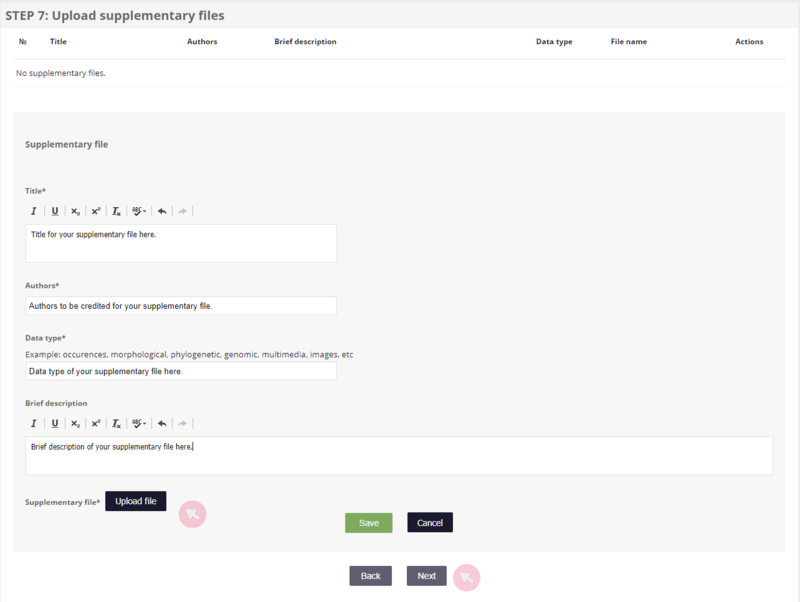 Download all submission files as a .zip file via the button on the right-hand side. To download files one by one, click on the name of the file. 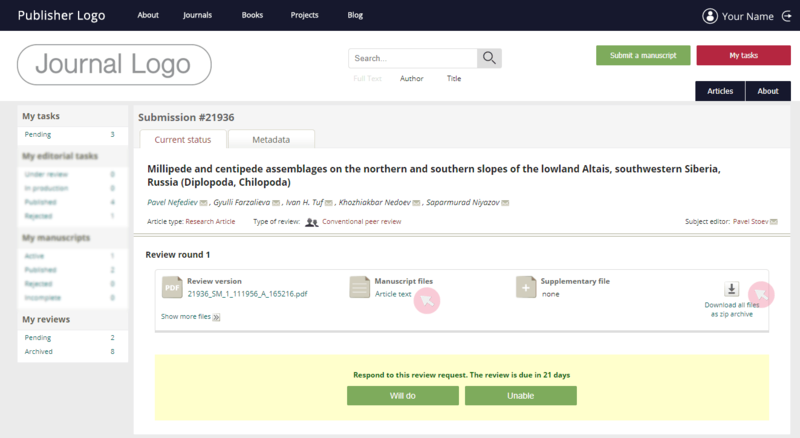 4 The History tab contains archive of the past review rounds (if any), including the uploaded file versions, reviews, editorial decisions and author’s replies. 1 Access the manuscript from Under review in the My editorial tasks menu. Access a submission by clicking on its title. 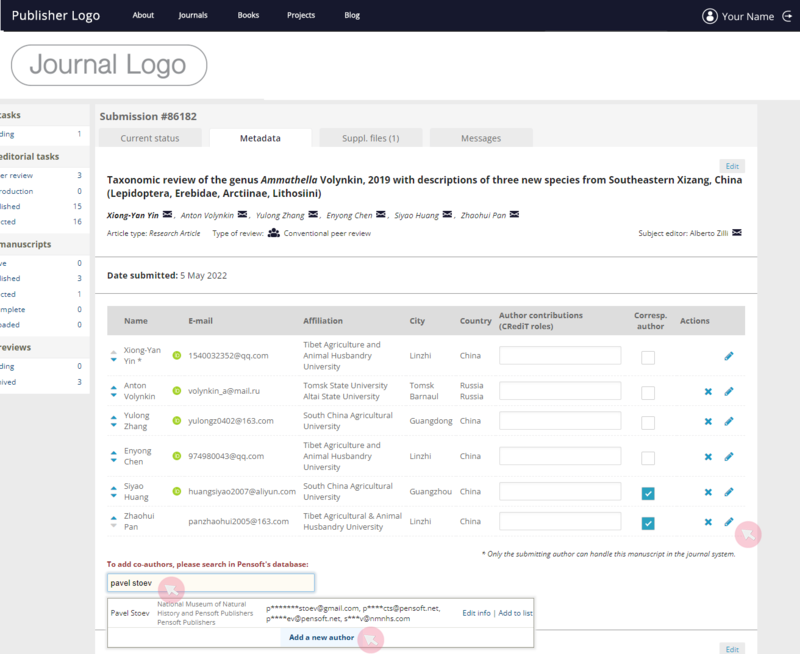 *As you type in a user’s name/email in the search field, a list of ARPHA-registered users matching the term will appear. If the user you are searching for is present in the database, click Add to list. If not, use the Add a new author button located at the bottom of the list to create a new user and mark him/her as a co-author of the manuscript. 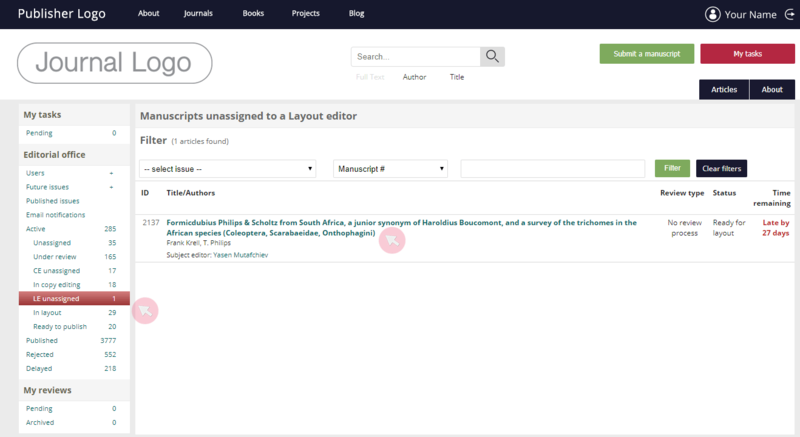 1 Find the manuscript in Under review from the My editorial task menu and access it by clicking on its title. 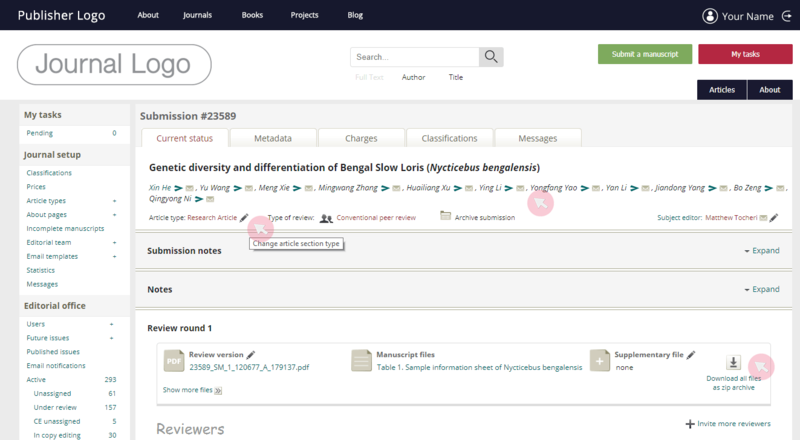 2 Use the Invite reviewers button* in the Current status tab to access a list of potential reviewers from the database matching the classification categories assigned to the manuscript. *In case you have already invited reviewers, but wish to send additional invitations, you will not be able to see this button. Use the + Invite more reviewers button instead. 3 The potential reviewers are ordered by relevance of expertise (visible under their names where matching scientific fields appear in bold). 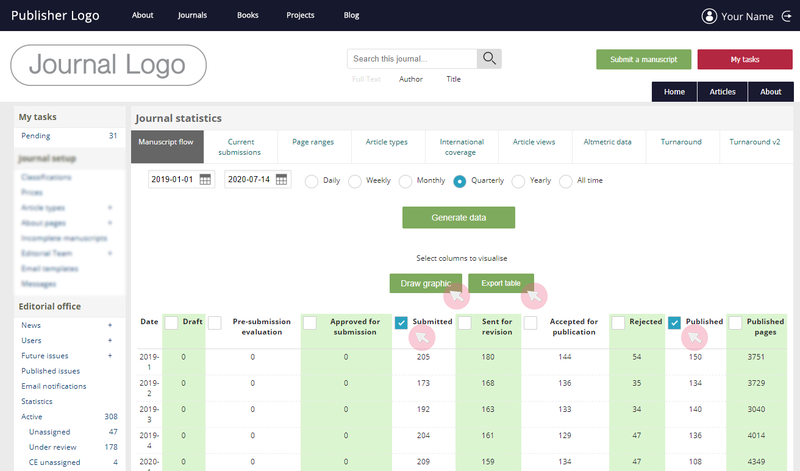 Reviewers suggested by the author during the submission are first shown, followed by reviewers added to the list by the SE, if any, and then reviewers suggested by the database. Once a reviewer is invited, his/her name disappears from the list. 4 Alternatively, use the search box at the bottom of the page to search the database for a particular person. As you type in a user’s name/email, a drop-down list of ARPHA-registered users matching the search query appears. If the searched person is present in the database, click Add to list. If not, use the Add a new reviewer button at the bottom of the list to create a new user and add him/her to the list. 5 Select the reviewers you want to invite via the Nominated column and then click the Invite reviewers button at the bottom of the page. 6 When you click Invite reviewers, the system will generate automated emails for each nominated reviewer and require that you send them one by one. You can add a personal message to each reviewer in the space above the content. Note: The selected reviewers will receive an automated email with a review invitation and automatic login link to the manuscript page. The reviewers have to respond by either accepting or declining the review invitation. A reviewer’s response is recorded in the database if submitted via the system. If the reviewer replies by email, the SE or the E can record the acceptance/decline in the system. A SE has the right to reject a manuscript prior to peer review if he/she finds it of insufficient scientific / linguistic quality and/or non-conformity with the journal's scope and guidelines. Note: Ensure that the author has not already requested linguistic services before rejecting a manuscript because of poor language. 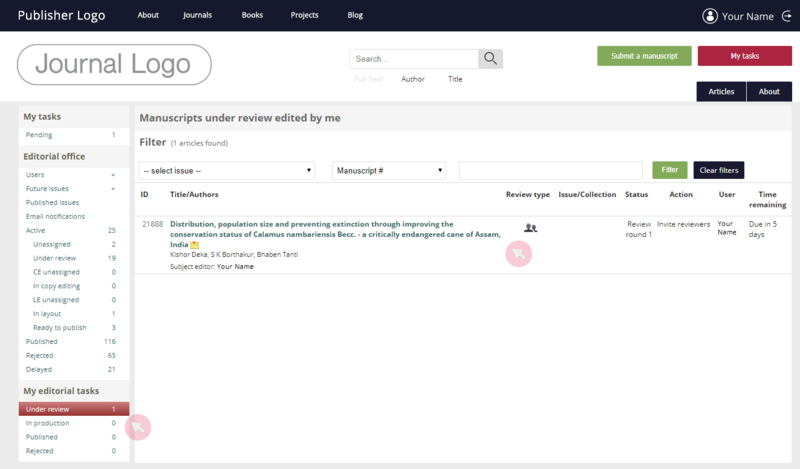 1 Find the manuscript in Under review from the My editorial tasks menu and access it by clicking on its title. 3 The system will generate a notification to the authors, informing them about your decision. They will be able to access the manuscript and the rejection notice. Note: The SE will be invited to evaluate the manuscript and make an editorial decision when all review invitations are completed either by review submission or decline. In most journals, an editorial decision can be made after the submission of at least one review. 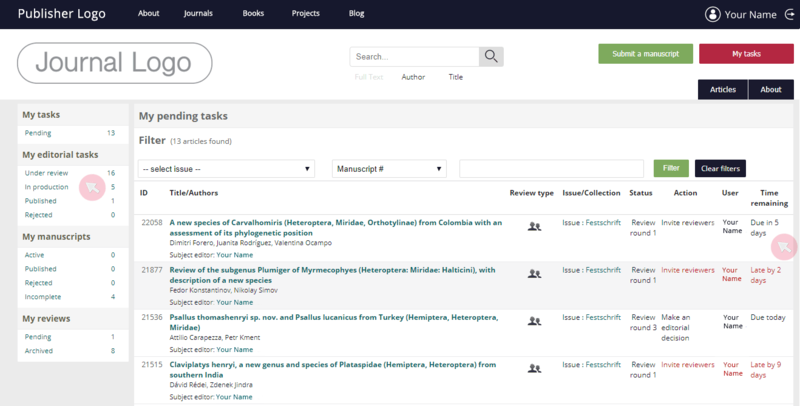 1 Find all manuscripts assigned to you in either Under review or In production from the My editorial tasks menu. 2 The Status column shows the current stage of the manuscripts. The Action column indicates the pending action(s) expected to be performed by the user shown in the adjacent User column. 3 Use Time remaining to keep track of due dates / delays. Whenever a user misses a deadline, his/her name and delay turns red to draw your attention. A reminder is sent to that user on the first and the third day past the due date. 4 Access the submission by clicking on its title. 5 To extend a deadline for a review, use the next to the due date. Note: A deadline extension does not generate an automated notification to the user whose action is expected. To inform him/her about the extension, contact him/her by using the next to the user’s name (click to generate an email* or right click to copy the email address) to contact the user. *The recipient will receive the email from your email address added to your user account. To change your contact email, click on your user name visible in the upper right corner of the screen and go to Account settings (see the Managing user accounts chapter). access a submitted review ( ). *A pop-up window will appear to let you add a personalised message to the automated email notification. 7 Use the Submission notes text field to make notes regarding your communication with an author/reviewer. 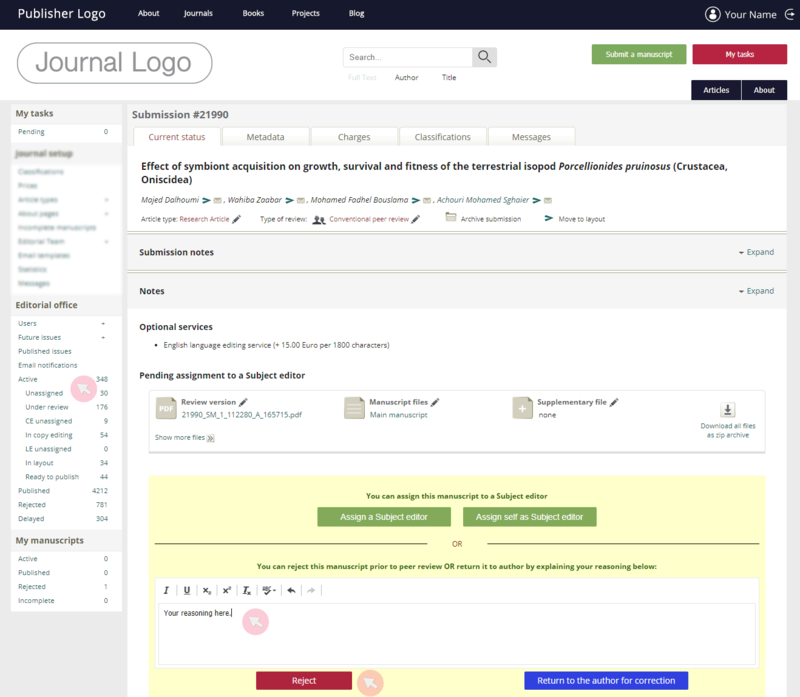 The notes are visible to the Subject editor, Journal manager(s) and Copy editor. Note: You are strongly encouraged to add the date and the addressees’ names. The purpose is to keep track of the messages sent to the users outside the system, so that reminders are not duplicated. 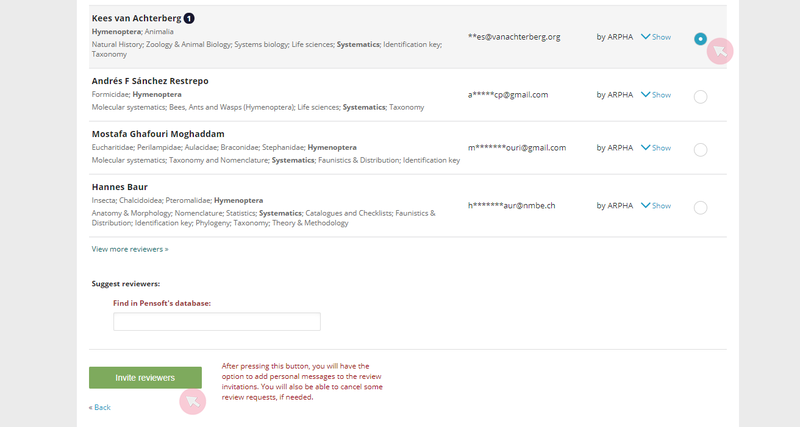 Subject editors can access a list of all automated notifications sent by the system in relation to the manuscripts assigned to them. 1 Find the manuscript from the My editorial tasks menu. Access the submission by clicking on its title. 2 Go to the Messages tab to see the list of automated notifications sent to date, where the most recent ones show up first. Click on Expand to see the full text of the email. some of the accepted review invitations have been cancelled via the system for various reasons, however at least one review has been submitted. 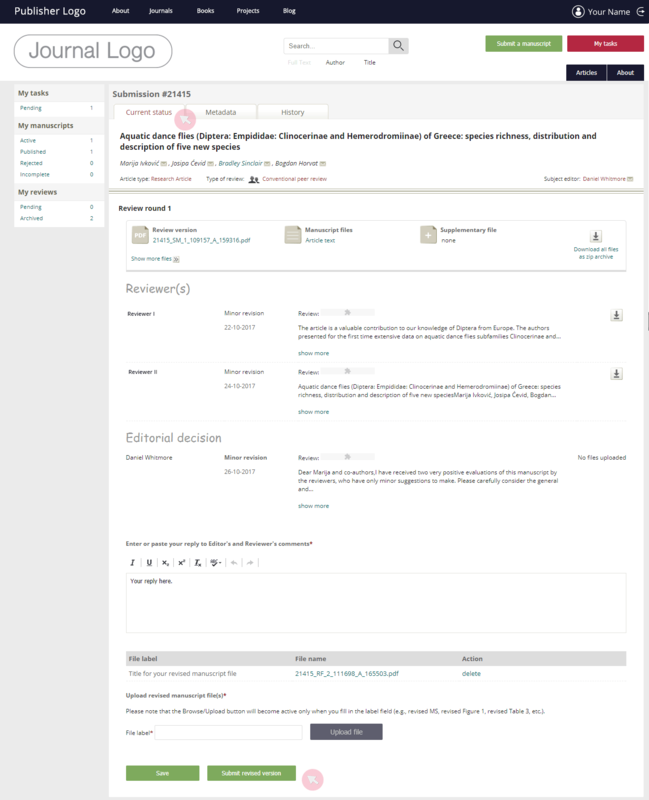 1 Access the manuscript from Under review in the My editorial tasks menu and click on its title. 2 Go to the Current status tab to find all submission files. Access the reviews by clicking on the . 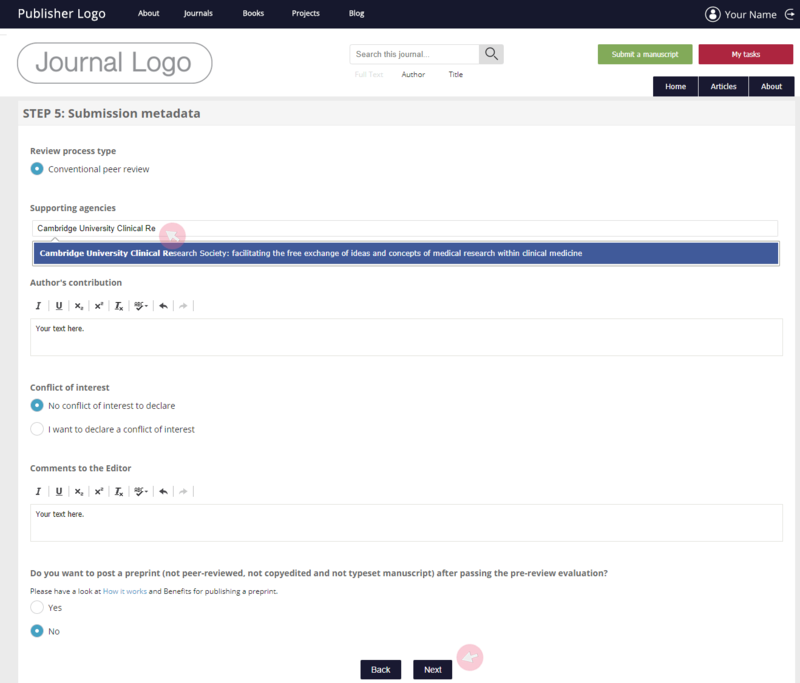 3 Use the Editorial decision button to access the editorial evaluation form and submit your editorial decision. Note: You will only be able to use the button if at least one nominated reviewer has submitted a review and there are no pending reviews or review invitations. 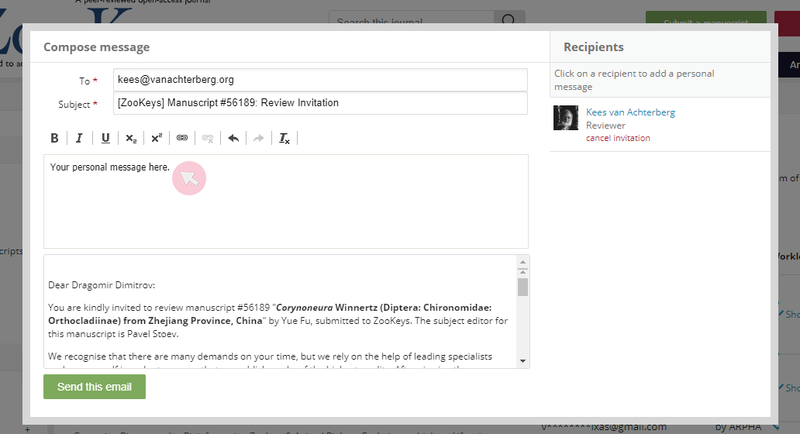 To cancel a review invitation or task, use the (a pop-up window will appear to let you add a personalised message to the automated notification). 4 Make sure to complete the mandatory fields (marked with *). 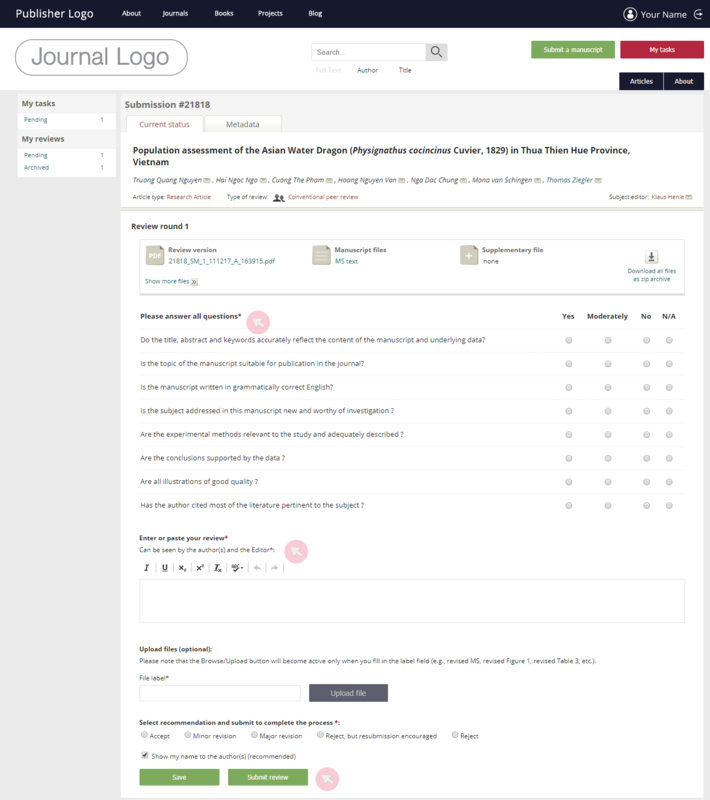 Type in your editorial evaluation in the text field and select a decision (i.e. Accept, Minor revision, Major revision, Reject, but resubmission encouraged or Reject). 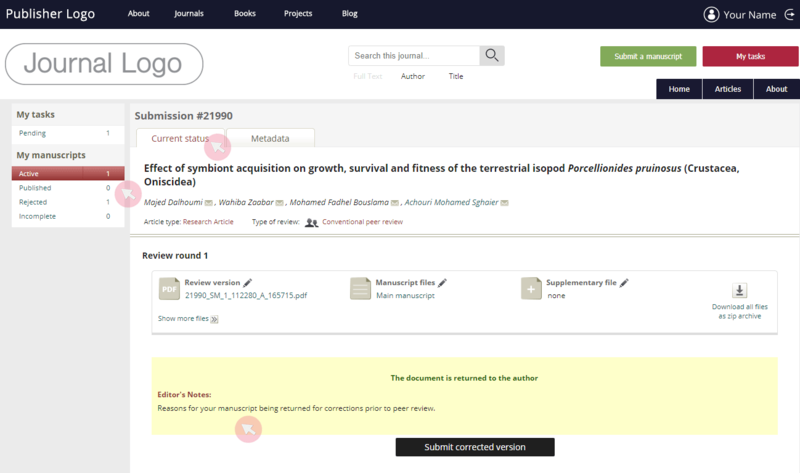 5 To upload a version of the manuscript with your notes / corrections, type in a title (e.g. revised MS, revised Figure 1 etc.) in the File label box and then use the Upload file button to select the file from your device (optional). 6 Use the Submit editorial decision button to submit your final decision. A pop-up window will appear to let you add a personalised message to the automated email notification. Alternatively, use the Save button to keep your evaluation as a draft. Note: In case the journal has opted for the alternative editorial process where the final decision on the acceptance or rejection of a manuscript lies with the Editor-in-Chief, your editorial decision will be sent to the E-i-C for verification. Once the E-i-C makes a decision, you will be notified via email. The author of the manuscript will be informed about the editorial decision only after the E-i-C has provided such. You retain the role and duties of the SE of the manuscript until it is conclusively accepted or rejected. 7 SEs are strongly encouraged to access the final proof of manuscripts they have already accepted for final quality assurance check. Use the link in the Final Proof Uploaded email to access the manuscript version intended for publication. In case of any concerns, reply to that email notification. Note: SEs are not notified via email about the progress of already accepted manuscripts during the copy edit and layout stages. However, they can track the progress of a manuscript from the In production tab in the My editorial tasks menu. Go to Current status to see the latest manuscript version submitted by the author. The History tab keeps the archive of all past review / copy editing / layout iterations. 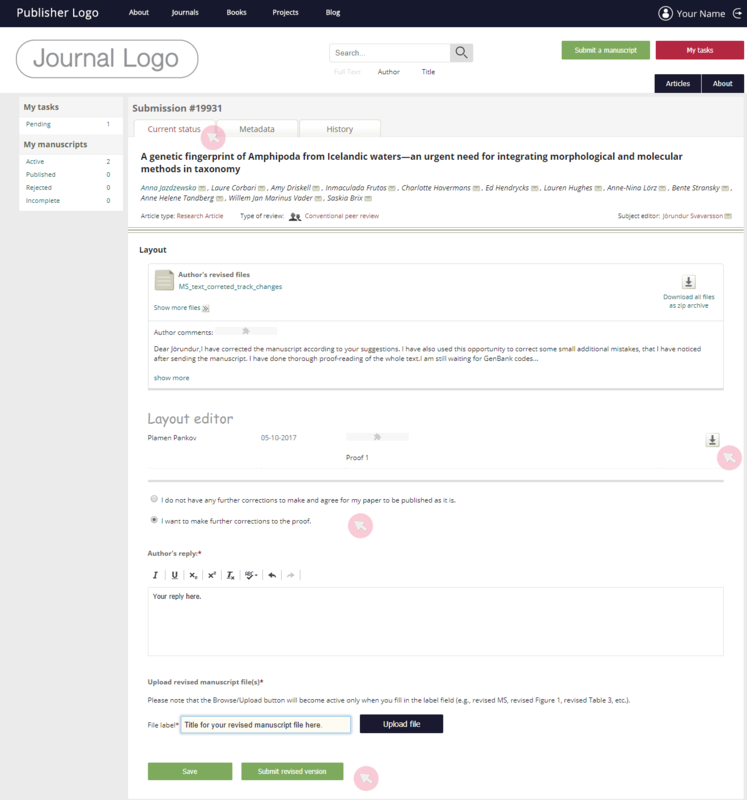 Journals published on the ARPHA platform can opt for the Revised version cross-check feature where reviewers are invited to access the revised manuscript as soon as the author submits such. The reviewers are informed that they are not required to take any further actions. However, they can send their further comments to the SE if they wish so. The feedback is sent to the SE via email. A Copy editor checks and corrects manuscripts for consistency and adherence to the journal’s style requirements and provides feedback to the authors / subject editors / Editorial office during copy editing. Depending on the journal policies, the Copy editor may also act as an English-language editor. 1 Find the manuscripts assigned to you in the My copy editing tasks menu. 2 The manuscripts awaiting your copy edits are sorted in Pending. Once you submit a copy-edited version, the manuscript is relocated to Archived. 3 Check the deadline for your copy editing task for each submission in the Time remaining column. Note: The manuscripts are ordered by ID number (high to low) with the most recently submitted showing first. They are not listed by the order of their CE assignment. 1 Locate a manuscript in Pending in the My copy editing tasks menu and access it by clicking on its title. 2 Download all submission files as a .zip file via the button on the right-hand side in the Current status tab. To download files one by one, click on the name of the file. In case you have points to discuss with the author, choose the first option and send your copy edits to him/her. Alternatively, email the copy-edited version to the Editorial office, if you consider the manuscript ready for further processing. 3 Use the text field to leave your general comments to either the author or the SE / Editorial office (depending on the selected recipient). 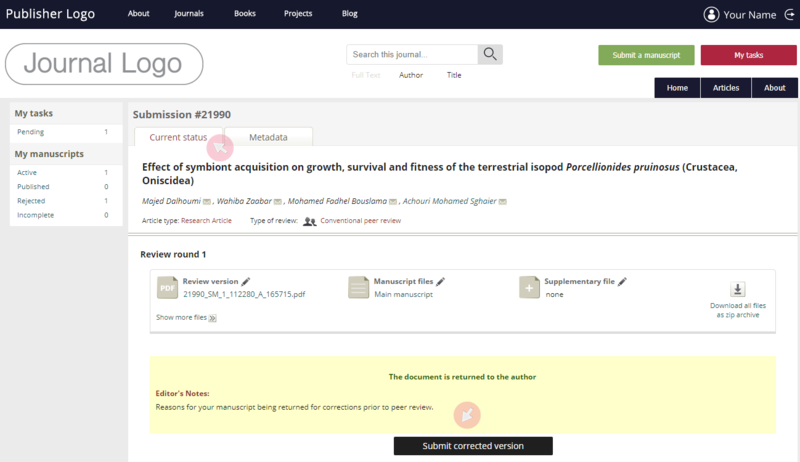 4 To upload your revised version of the manuscript, type in a title in the File label field and then use the Upload file button to upload the file from your computer. 5 Click the Send revised version to the author or Send revised version to Editorial office button at the bottom to submit your revised version. Showing will be the button corresponding to the option selected above. 6 Alternatively, click Save to complete your revised version submission at a later stage. 1 Locate a manuscript in My copy editing tasks and access it by clicking on its title. 2 Go to the Metadata tab to access the metadata of the submission. 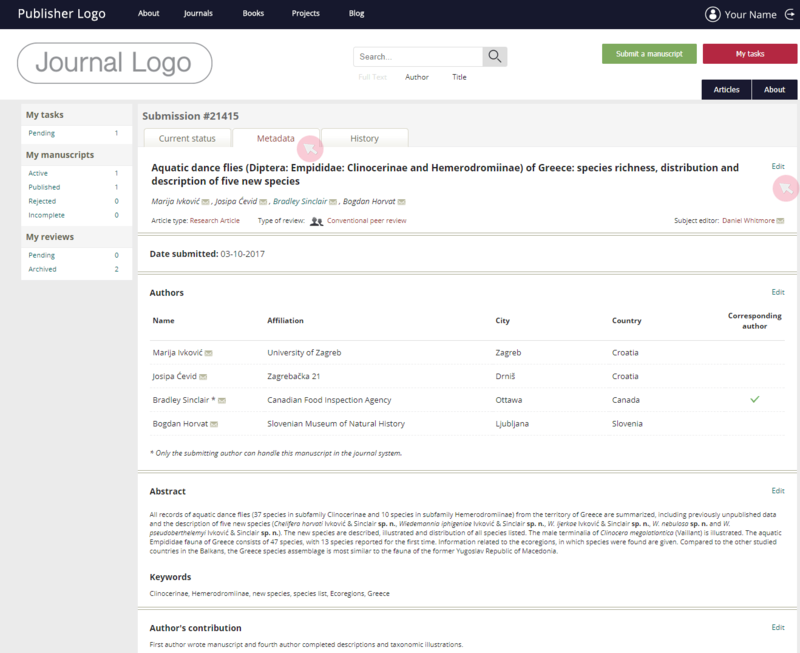 The metadata includes a number of details, such as submission date, authors’ affiliations, abstract and keywords of the paper, classifications assigned to the manuscript and others. Use the clickable next to a user’s name to generate an email to the respective user. Alternatively, right click the icon ( ) to copy the user’s email address. Note: The recipient will receive the email from your email address added to your user account. To change your contact email, click on your user name visible in the upper right corner of the screen and go to Account settings (see the Managing user accounts chapter). 1 Access all manuscripts copy-edited by you in Archived in the My copy editing tasks menu. 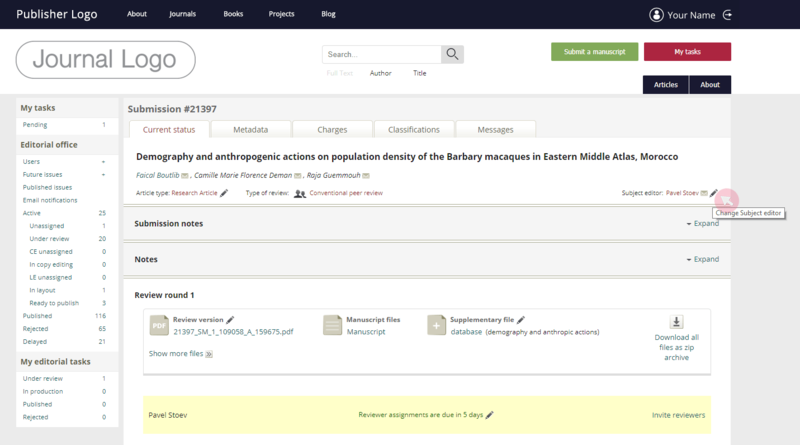 2 The Status column shows the manuscript’s current processing stage. 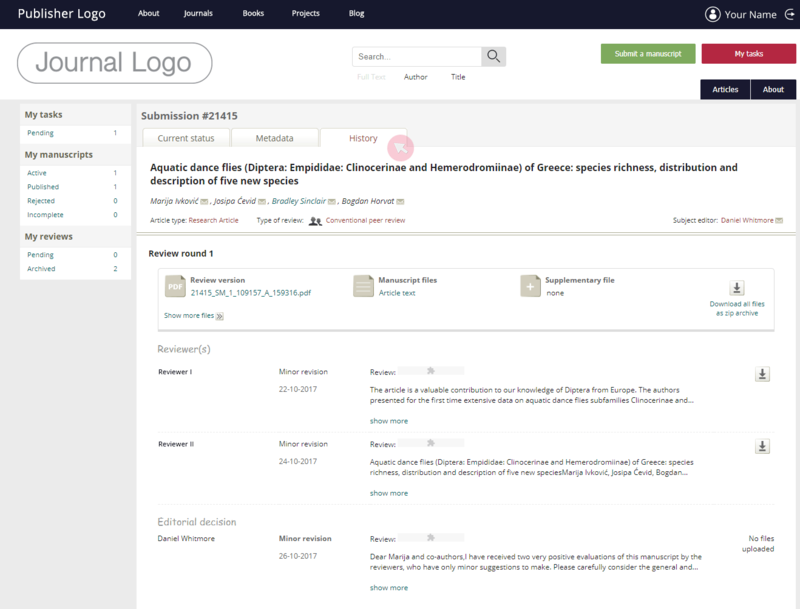 3 A clickable Digital Object Identifier (DOI) for each manuscript is visible once the manuscript has proceeded to the layout stage. When the paper is published, the link becomes active and leads to the published article. 4 To access a detailed information about a manuscript submission, click on its title. 5 The Current status contains the submission files sent for production. Your copy-edited version appears at the bottom of the page. All accompanying comments left to the author / Editorial office are also visible. 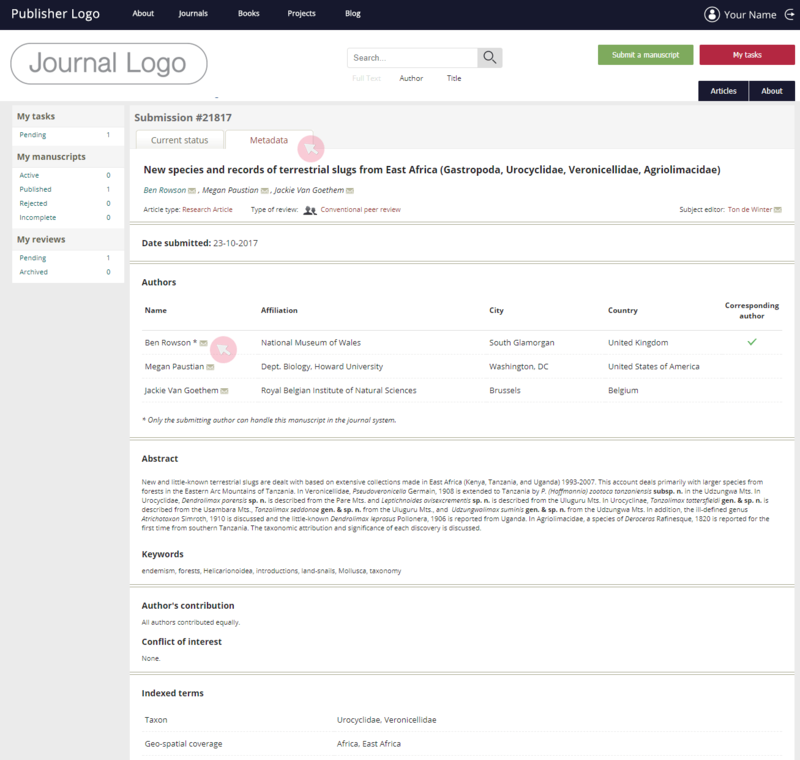 6 The Metadata tab includes a number of details, such as submission date, authors’ affiliations, abstract and keywords of the paper, classifications assigned to the manuscript and others. 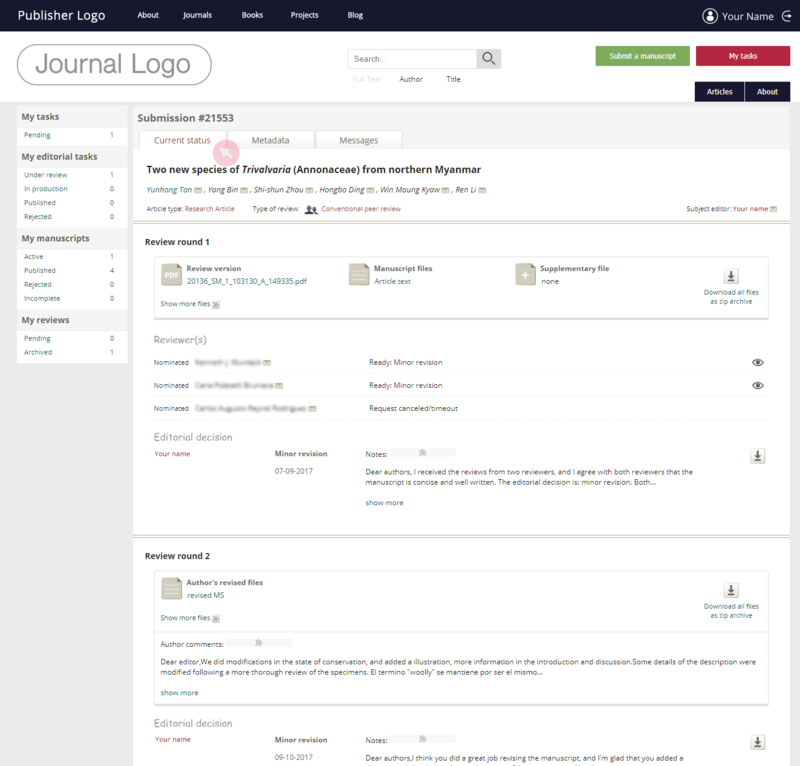 Reviewers in ARPHA are all users who have submitted at least one review to a manuscript processed by the system. A reviewer evaluates the scientific quality of assigned manuscripts. A reviewer needs to provide critical yet constructive feedback to the author(s) and a recommendation for either revision, acceptance or rejection of a manuscript to the Subject editor. Reviewers may reveal their identity or remain anonymous, depending on a journal’s terms and policy. 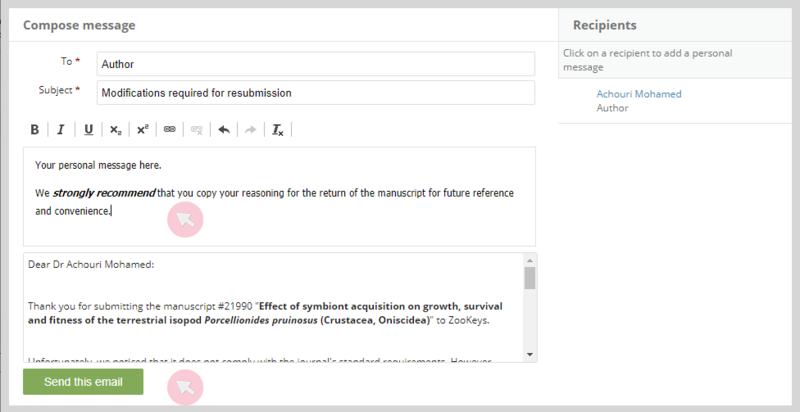 Review invitations in ARPHA are normally sent from either the Subject editor, Editor-in-Chief or Managing editor via automated email notifications. The email will contain the name of the Subject editor who has nominated you and an automatic login link to the manuscript. Your agreement or refusal to review the manuscript will usually be expected within 5 days. Note: Your review invitations are based on the expertise listed in your user account. In case you are receiving invitations for manuscripts outside your competence, click on your user name in the upper right corner of the screen and go to My expertise to edit your expertise (see the User accounts chapter). 1 Click on the hyperlinked title of the manuscript from the email notification to access it. 2 Use the button on the right-hand side to download all submission files. To download the files one by one, click on their titles. 3 Use the buttons at the bottom of the page to either accept or decline the invitation. You can add a personal message to the Subject editor in the empty space above the standard email text. Note: By default, two reminders will be emailed to you until you either accept or decline the review invitation in the system. The reminders are sent on the first and the third day past the due date for your response. 4 Once you accept a review invitation, your review will be expected within a certain time frame as set up by the journal (normally 21 days). 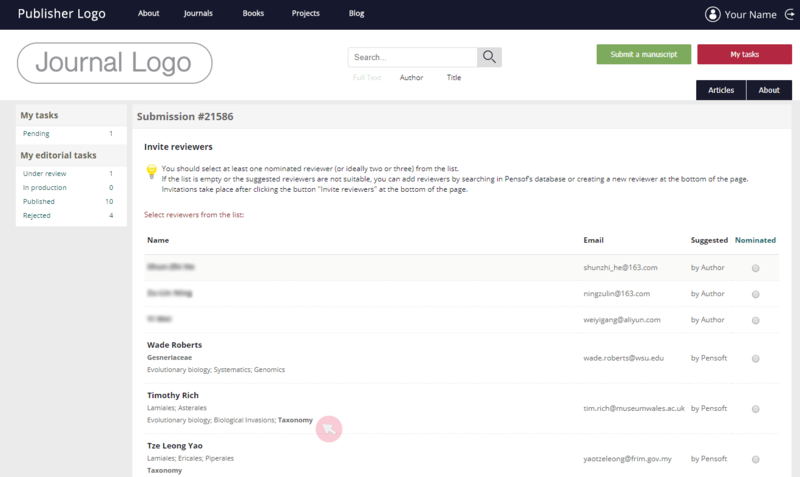 Use the Pending tab in the My reviews menu* to keep track of the deadline. To request an extension for your review submission, contact the journal’s Editorial office. Note: By default, a reminder will be emailed to you on the first day past the due date for your review submission. In case you do not submit a review within seven days, your review invitation will be canceled. 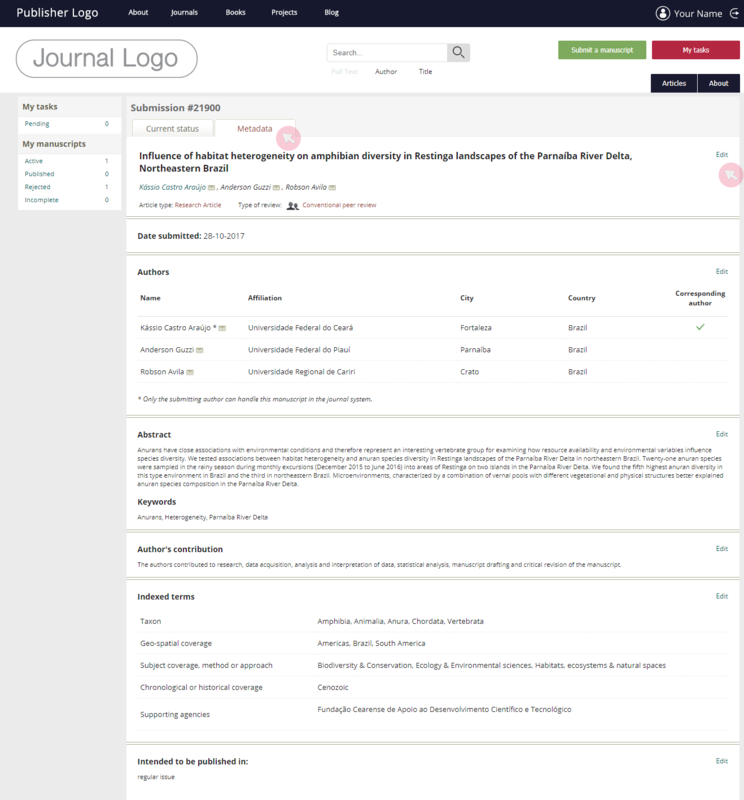 *To access your user dashboard, use the My tasks button visible in the header of the journal’s page once you have been assigned with a task from the journal or have submitted a manuscript to it. 1 Follow the hyperlinked manuscript title in the email notification to access the manuscript. Alternatively, find it in Pending in the My reviews menu* and click on its title. Note: The task will be visible in the My reviews menu only after you have accepted the review invitation via the system. 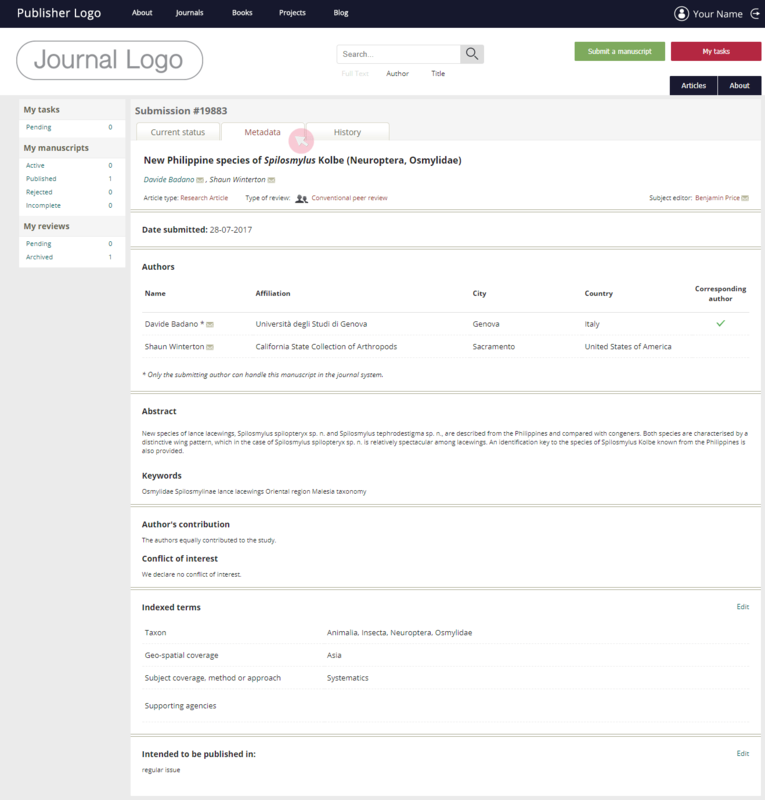 *To access your user dashboard, use the My tasks button visible in the header of the journal’s page once you have been assigned with a task from the journal or submitted a manuscript with it. 2 Go to the Current status tab to find the latest submission files and use the button on the right-hand side to download all of them. To download the files one by one, click on their titles. 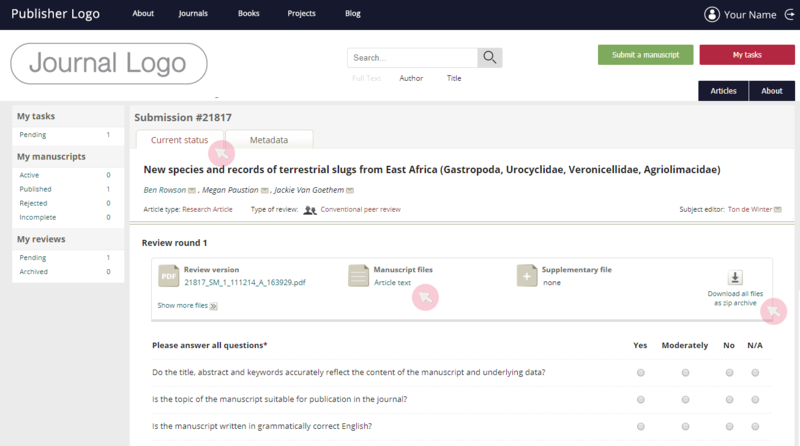 3 Go to the Metadata tab to find a number of details, such as the submission date, authors’ affiliations, abstract and keywords of the paper, classifications assigned to the manuscript and others. You can send an email to the user by clicking next to a user’s name. * Alternatively, right click the icon ( ) to copy the user’s email address. Note: ARPHA supports open science practices, hence reviews are set up as non-anonymous by default. However, a reviewer may still opt to remain anonymous by unchecking the corresponding option while completing the review form (see below). Please note that your name may be visible in comments and tracked changes in the manuscript files. 1 Locate the manuscript in the Pending tab from the My reviews menu. Click on its title to access the submission. 2 Go to the Current status tab to access the review form and submit your recommendation regarding the publication of the manuscript. 3 Answer all questions in the review form. 4 Leave your evaluation in free text in the field provided. Make sure to clearly explain your reasoning behind your recommendation. 5 If necessary, upload files (e.g. the manuscript file containing inline comments and/or notes). Type in a title for your file in the File label box and then use the Upload file button to browse your device. Note: In case you do not wish to reveal your identity to the author(s), ensure that you delete any personal information, such as your name next to track changes/notes in a document file. 6 Select your recommendation on revision, acceptance or rejection of the manuscript. 7 You are encouraged to reveal your identity to the author(s) by checking the box at the bottom of the page. Note: The box is checked by default in line with ARPHA’s open science policy. 8 Click the Submit review button when ready with your evaluation. Alternatively, use Save to complete your review submission at a later stage. 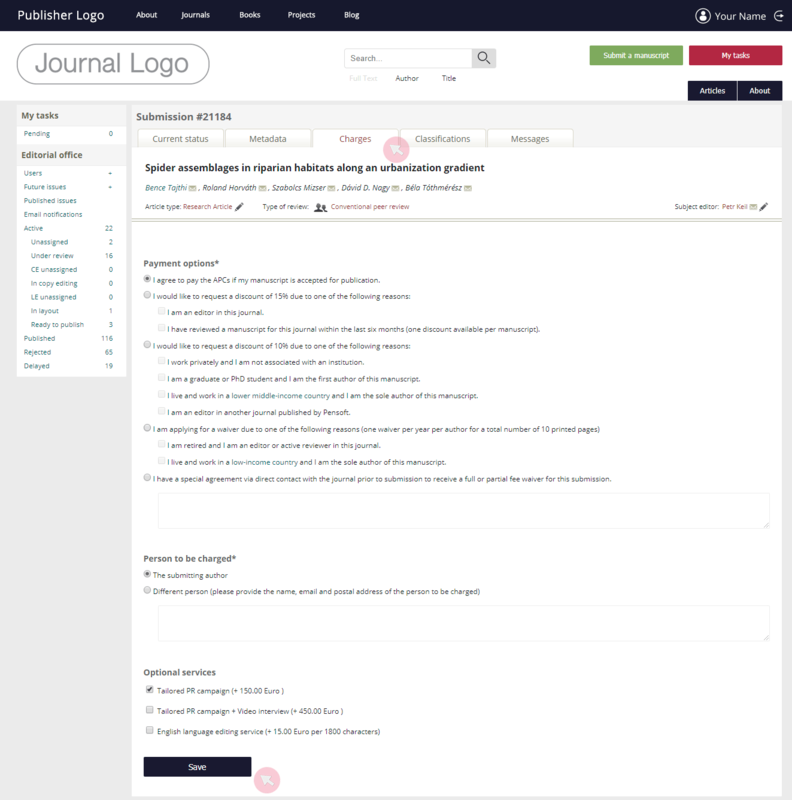 Journals published on the ARPHA platform can opt for the Revised version cross-check feature where reviewers are invited to access the revised manuscript as soon as the author submits such. 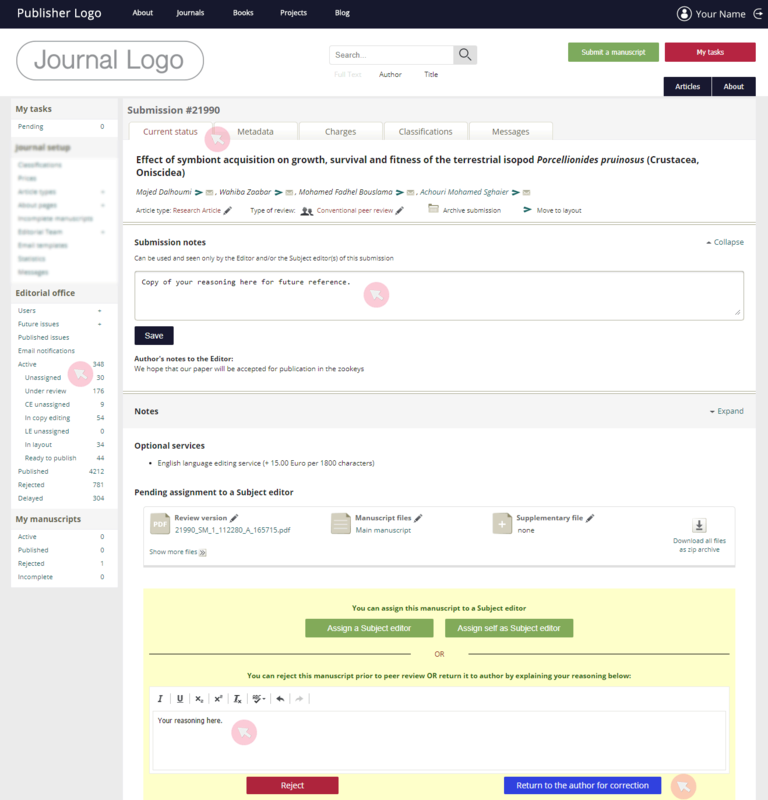 Although the reviewers are not required to take any further action at this stage, they can still send their comments and feedback to the Subject editor if they wish to do so. 1 Follow the hyperlinked manuscript title in the email notification on the submission of a revised manuscript version of the manuscript you have reviewed. Alternatively, find the reviewed manuscript in the Archived tab from the My reviews menu and click on its title to access it. 2 Use the Send feedback button from the History tab to submit your comments to the Subject editor. 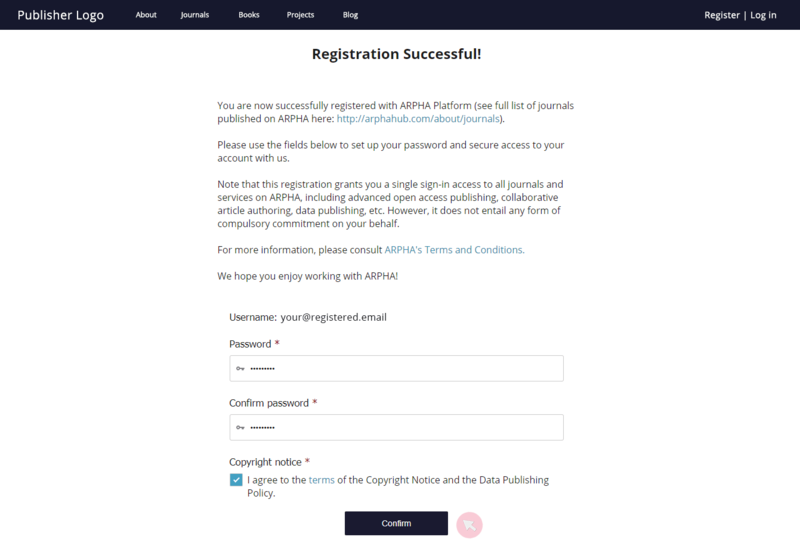 An author is any ARPHA-registered user who has submitted* a manuscript to a journal using the ARPHA publishing platform. To have his/her manuscript accepted for publication, an author needs to ensure that his/her work is of sufficient scientific / linguistic quality to conform with the journal’s scope and policy. *Co-authors can also access the manuscript submission once they are registered with the system and added to the list of authors. However, their user rights are very limited compared to those of the submitting author. Most importantly, they cannot upload revised versions and proofs. It is only the submitting author who can assign another co-author as a submitting author. Please ensure that you have provided all mandatory information and your manuscript and submission files fully comply with the journal’s policy and standards. Failure to do so may result in your manuscript being returned for corrections and resubmission prior to peer review. 1 Log in to your ARPHA account at the journal’s website. 2 Press the Submit a manuscript button in the header to start the submission process. Note: The submissions steps and their content may vary across article types and journals, depending on the journal’s terms and policy. 3 Provide all mandatory information requested at each page to complete your submission. 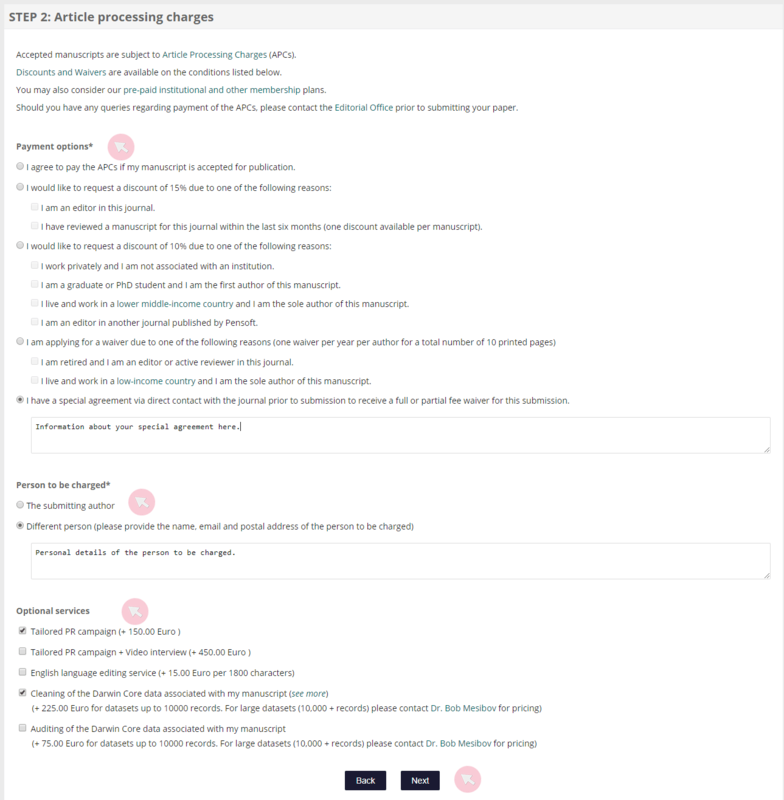 Note: To return to a previous submission step, click Back at the bottom of the page (any edits in the current step will be automatically saved), rather than the equivalent functionality button available from your browser. The latter may crash the submission, so you will need to refresh the webpage. 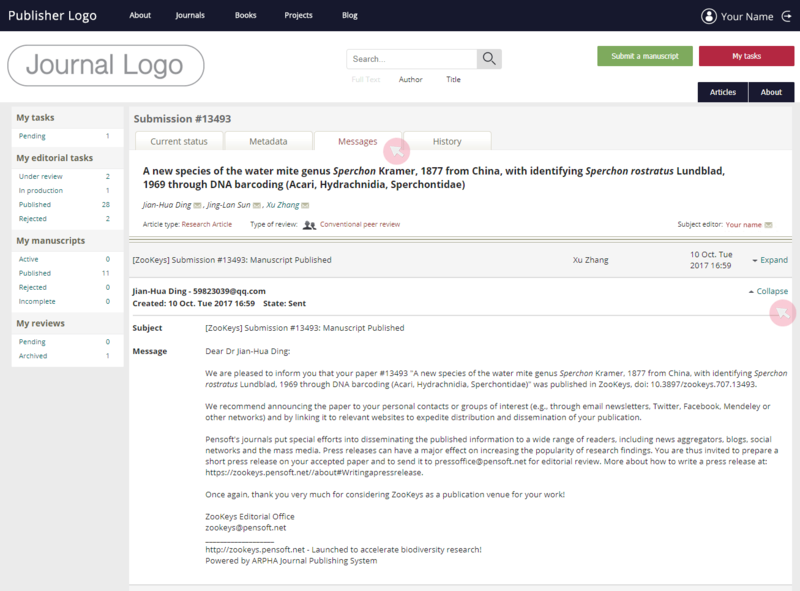 4 Your submission is only successful when you click the Finish button at the last step and receive the corresponding notification. Note: The co-author(s) as well as the author, will receive an email notification about the new manuscript submission, provided that they have been listed as authors by the submitting author during the manuscript submission process. 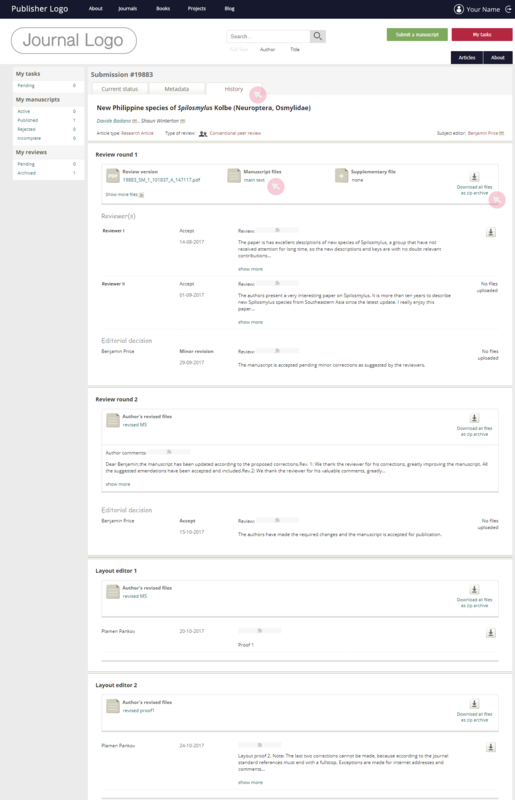 5 Access a list of your incomplete submissions from your author dashboard after login. Find them in the Incomplete manuscripts tab in the My manuscripts menu*. Use the clickable commands at the right-hand side to either complete or delete it. Note: All manuscript submission forms are automatically saved in the system until you submit or delete them. 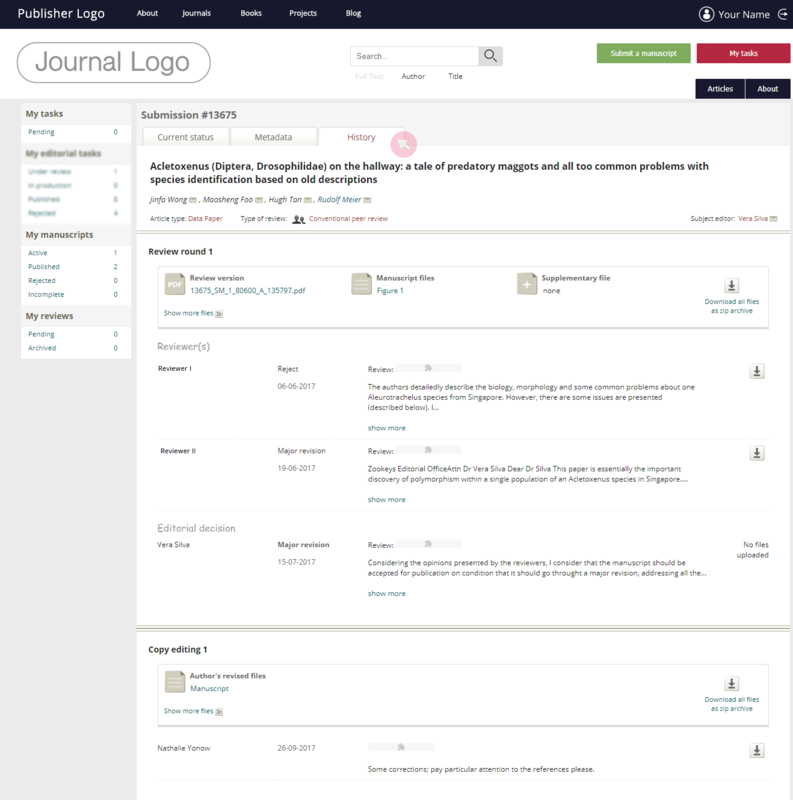 *The menu is accessible from the My tasks button visible in the journal’s header. The button becomes visible once you start a manuscript submission or have been assigned with a task. 1 Select the article type your manuscript corresponds to by using the drop-down menu and check/confirm that your manuscript is ready for submission in accordance with the journal’s format and conditions. 2 Select a payment option or request a discount / waiver and opt for additional services*. Both the Article Processing Charges (APCs) and the costs of any additional services are invoiced once the manuscript is accepted for publication. Note: In case you select to appoint another institution/person to be charged or state that you have a prior agreement regarding the charges, the system will generate additional text fields for you to provide more details. *Subject to an extra charge shown in parenthesis. 3 Add your co-authors’ details and the article metadata (title, abstract and keywords) of your manuscript. These will comprise your paper’s metadata used for indexing once the manuscript is published. To add a co-author, type in his/her name or email in the text box provided. A list of ARPHA-registered users matching the query will appear. If the user you are searching for is present in the system, click Add to list. If not, use the Add a new author button at the bottom to create a new user and add him/her as a co-author. To re-order the authors list, use the arrows at the left-hand side. Use Edit to update an author’s personal details (e.g. name, email, affiliation(s), city and country). Use the check boxes in the Corresponding author column if an author other than yourself is to be listed as such in the published article. Click on Appoint as submitting author in the Authors section to change the submitting author. Note: Only the submitting author can handle the manuscript in the system. If you re-delegate the role to an author other than yourself, you will no longer be able to submit revised versions / proofs. It is only the submitting author who can assign another co-author as submitting author.Assign classifications categories for your manuscript using the hierarchical classification trees. These will comprise your paper’s metadata used for indexing once the manuscript is published. 4 Assign classifications categories for your manuscript using the hierarchical classification trees. These will comprise your paper’s metadata used for indexing once the manuscript is published. Use the plus (+) symbol on the left-hand side to access the sub-categories or type in the text field. Check as many boxes as necessary. 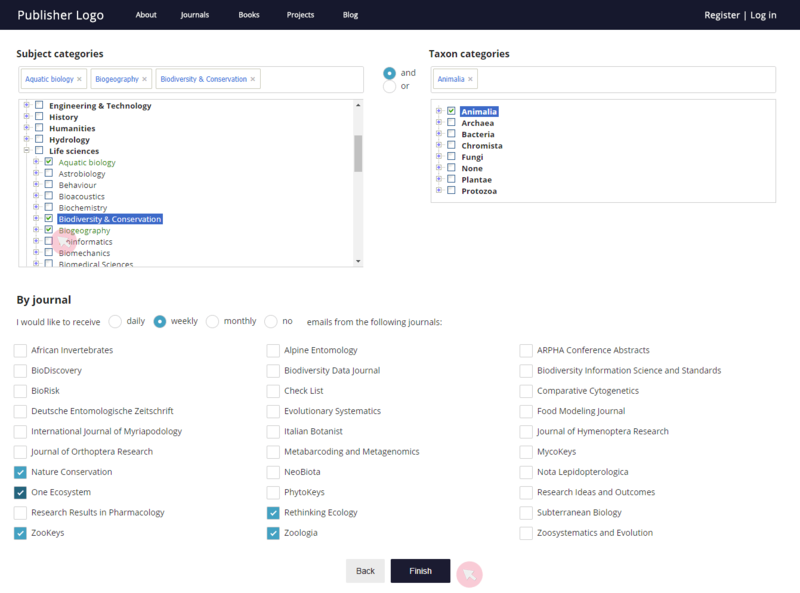 Note: We strongly recommend that you select the lowest possible categories and unselect the higher classifiers as it will facilitate and expedite the peer review process and put your published articles in the right context for better discoverability and indexing. 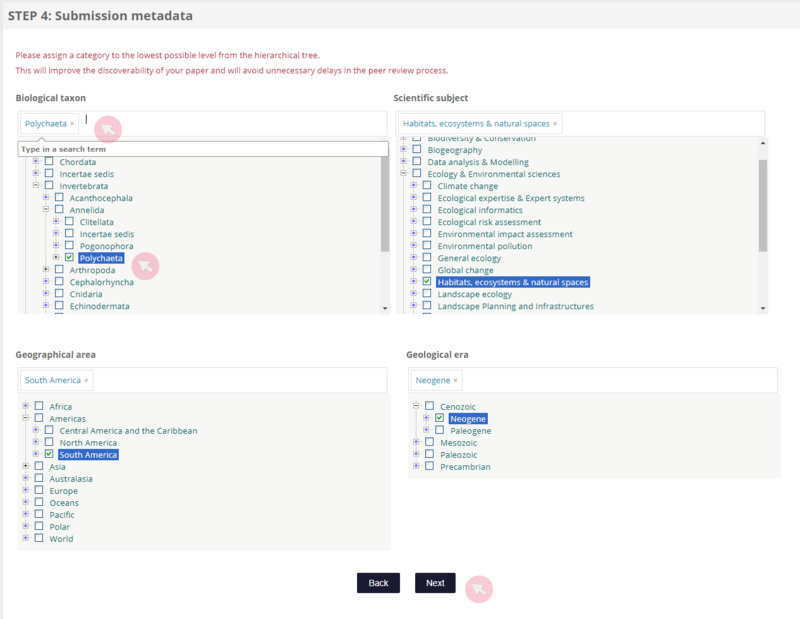 5 Select the type of review process (if applicable) and provide additional information to complete the metadata of your manuscript used for indexing once the manuscript has been published. Mark any supporting agencies, authors’ contributions and potential conflicts of interest in the corresponding fields. Please note that these texts will appear unaltered along with your article if the latter is accepted for publication. Leave your comments to the Editor. Note that these will appear along the manuscript submission files while being processed in the system. Your comments will be visible to the journal editors. Use the drop-down menu at the bottom of the page to submit your manuscript to an already existing special issue. 6 To upload your submission files, make sure that they comply with the format and size requirements noted within each section. 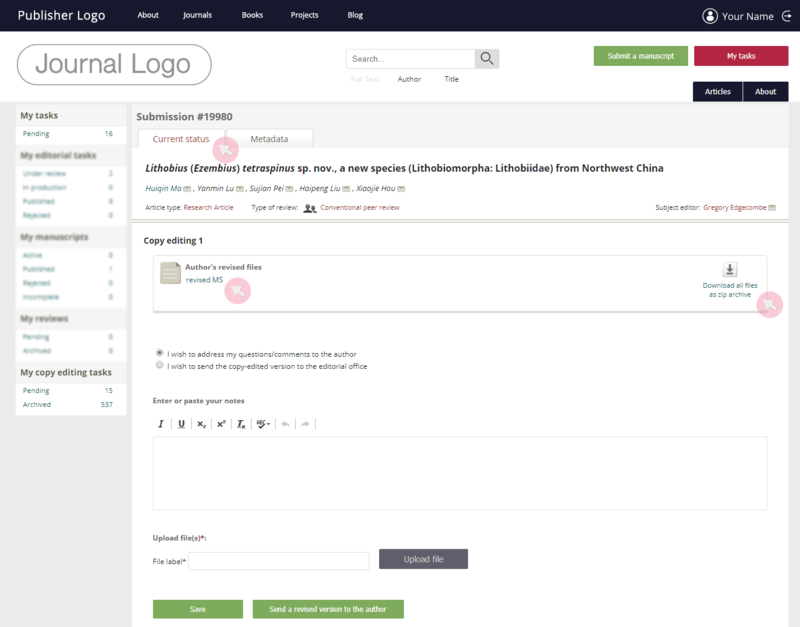 Use the Upload the manuscript file button to browse the files on your computer and upload your manuscript along with all featured visuals in low resolution, so that they do not exceed the size limit. Upload the manuscript file and the additional submission files separately, so that you can submit the images in high resolution as well. Type in a title for each file (e.g. Manuscript, Image 1, Table 1) to make the Upload additional file button active. 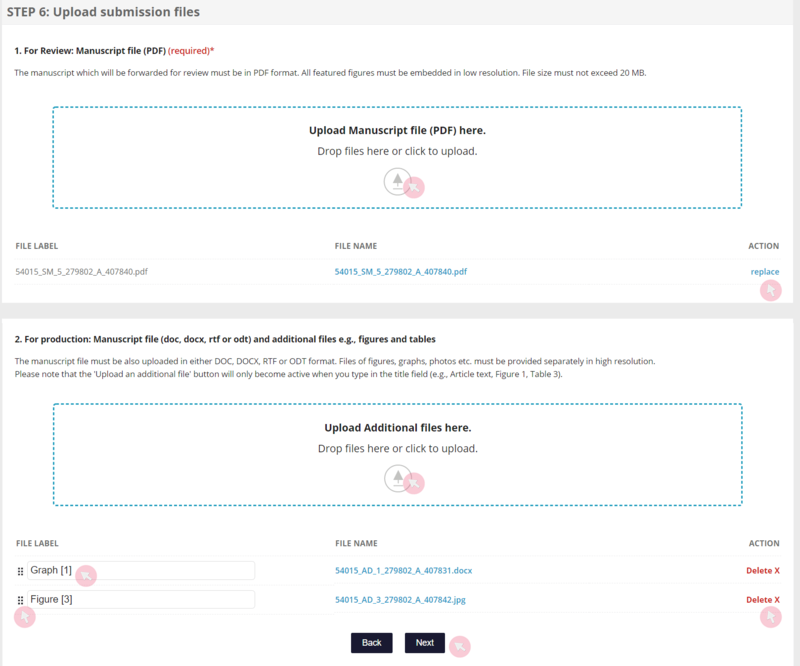 Additional fields will appear once you upload a file. 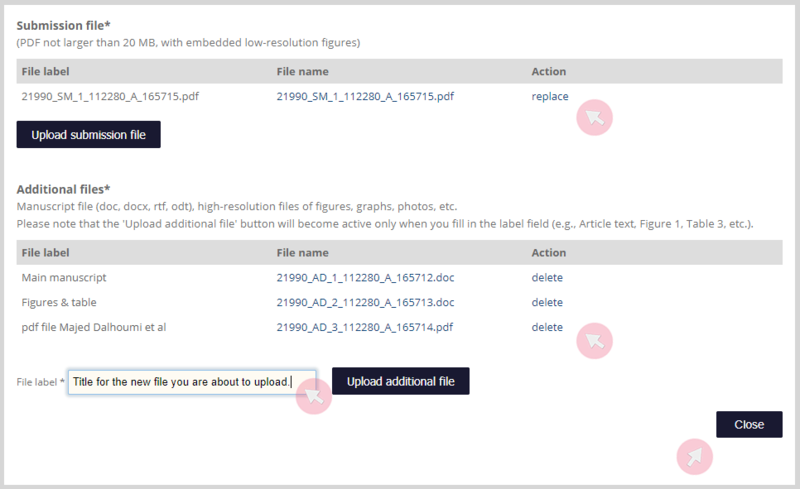 Note: Use the clickable commands in the Actions column to replace or delete uploaded files. Click on the name of a file to download it. 7 To add a supplementary file, fill the form and upload the file from your computer. 8 Suggest reviewers by inserting their name/email address. As you type, a drop-down list of ARPHA-registered users matching the search query appears. If the person you are searching appears, click Add to list. If not, use the Add a new reviewer button at the bottom to create a new user and add him/her to the list. Remove selected users by using the clickable commands in the Actions column. Note: This step might be mandatory, depending on the journal’s terms and policy. 9 Finalise the manuscript submission. The Editor may return your manuscript for corrections prior to peer review on the occasion that your manuscript does not fully comply with the journal’s policy and standards. Ordinarily, the reason would be minor technical issues, e.g. noncompliant image format or missing metadata. If this is the case, you will receive an email notification via the system asking you to submit a corrected version. 1 Use the link from the email to access your manuscript submission. Alternatively, find it in Active in the My manuscripts menu and click on its title. You can find the note from the editor explaining the reason(s) your manuscript has been returned in the Current status tab. 2 To edit submission files (e.g. manuscript file, figures, supplementary materials), go to the Current status tab and click the to access the corresponding section. In the pop-up window, you can replace / delete any of your submission files or upload a new one via the Upload a submission file / Upload additional file button. When ready, scroll down and click Close. Note 1: In case you need to add a title for your submission file, the Upload button will remain inactive until you fill in the field provided. Note 2: In case you need to replace any of your submission files, try to change them one by one, so that you have at least one file remaining in the section at any time. The system will not allow for the section to be left empty. Note that the oldest files will be showing at the top. 3 To edit your metadata (e.g. authors, affiliations, article classification, abstract text, keywords), go to the Metadata tab and click Edit in the respective section. Make sure to click Save to keep your edits. 4 Once you have made all requested changes, go to the Current status tab and use the Submit corrected version button to re-submit your manuscript. Note: Once you re-submit your manuscript, its status will change to Pre-review evaluation and you will no longer be able to edit your submission. The metadata of a manuscript are details used for indexing once an article has been published. Well-compiled metadata facilitate the discoverability and proper indexing of an article when published. During the processing of the manuscript, these data are used when assigning subject editors and inviting reviewers. Note: You will only be able to edit the metadata of your manuscript prior to its assignment to a Subject editor and after the conclusion of a review round. You will not be able to make any further changes during a review round or after submitting a proof for production (layout). 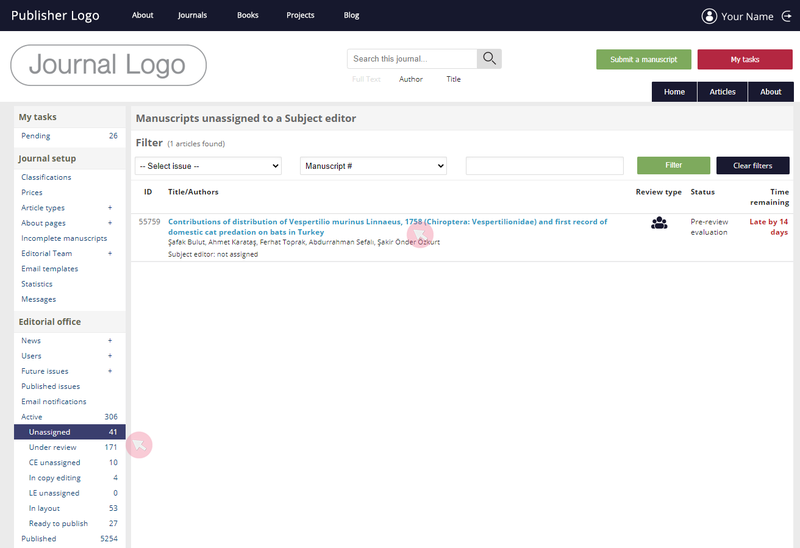 1 Locate your manuscript in the Active tab of the My manuscripts menu. Click on its title to access the submission. *It is only the submitting author who can assign this role to a co-author. Once a submitting author re-delegates the role, he/she will no longer be able to submit revised version or proofs. **As you type in a user’s name or email, a drop-down list of ARPHA-registered users matching the searched text string will appear. If the user you are searching for is present in the system, click Add to list. If not, use the Add a new author button at the bottom of the list to create a new user and mark him/her as a co-author of a manuscript. You will receive an automated email to notify you about the completion of each review round and invite you to submit a revised version. 2 Go to the Current status tab to see the recommendations and decisions made by the reviewer(s) and the Editor. Use the buttons at the right-hand side to download your manuscript file(s) along with inline comments. 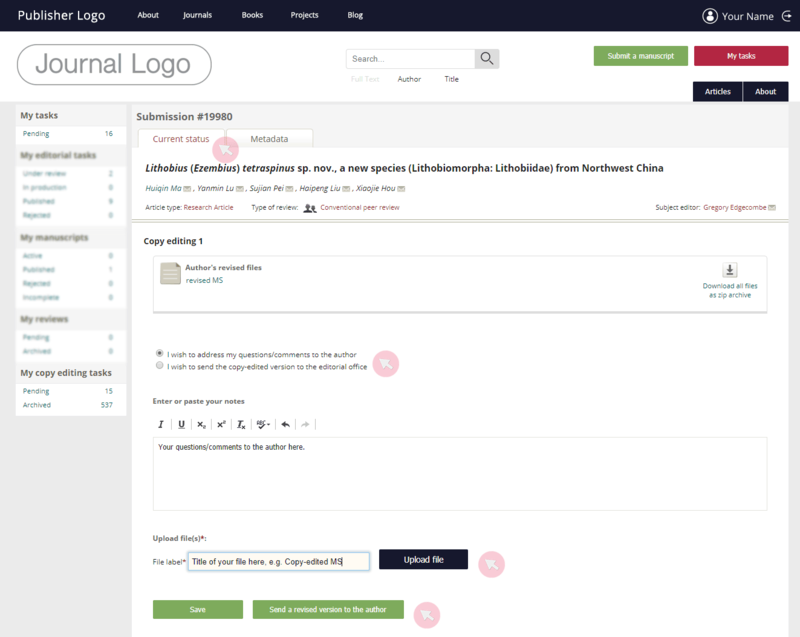 3 Use the text field to leave your comments to the reviewer(s) and Editor. 4 To upload a revised version of your manuscript, first type in the name for your file and then use the Upload file button to browse the files on your computer. 5 Edit the metadata (i.e. authors list, abstract, keywords, Conflict of interest section etc.) of your manuscript prior to submitting your revised version, if necessary. You will not be able to make any changes to these while the manuscript is under review / pending editorial decision. 6 Click Submit revised version when ready or use the Save button to complete your submission at a later stage. Once submitted, you will not be able to edit / replace files. You will receive an automated email to notify you about the acceptance of your manuscript and invite you to submit a version for the copy editing stage. 2 Go to the Current status tab to see the final editorial decision and comments. In case the Editor has uploaded any files (e.g. 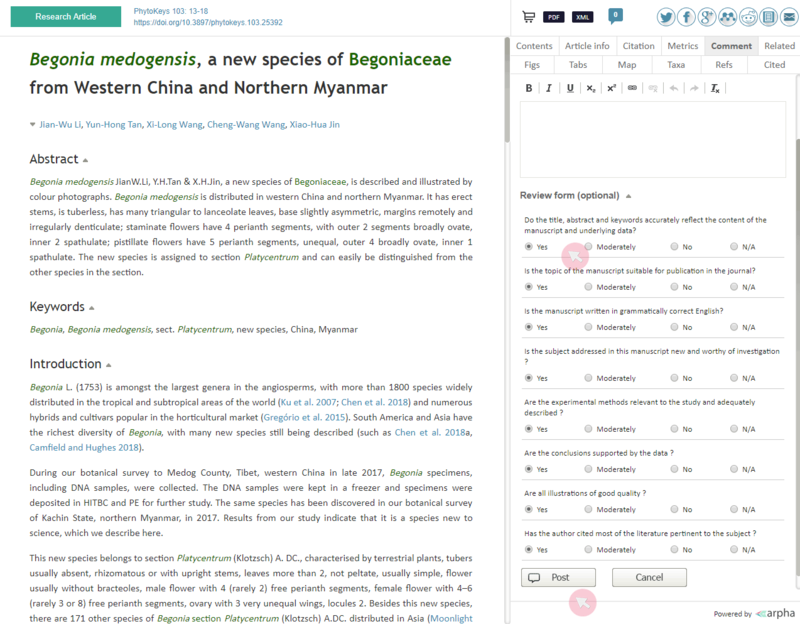 your manuscript with inline notes), locate and download it on the right-hand side. Note: You might need to correct some fine details before sending the manuscript to the Copy editor, even though it has already been accepted for publication. Make sure to clear any inline comments in the manuscript file and double-check its content, metadata and the Editor’s notes. 3 Opt to either submit a revised version of your manuscript or send your last uploaded manuscript file right away to copy editing. The space below the options will change depending on your choice. 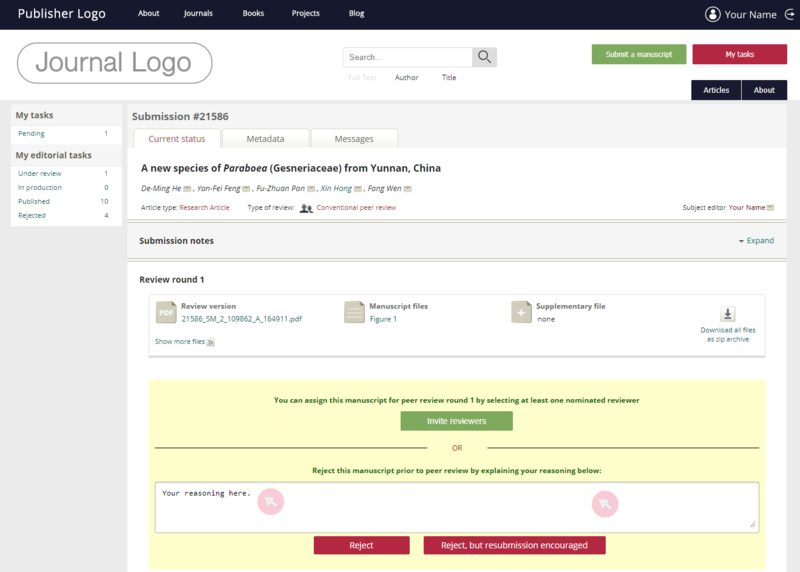 4 To submit a revised version, use the text field to respond to the Editor’s comments, type in a label for your manuscript and then use the Upload file button to browse the files on your device. Either click Submit revised version or use the Save button to complete your submission at a later stage. Once submitted, you will not be able to edit/replace files. 5 In case you are approached by the Copy editor with further questions and requests regarding your manuscript, access your submission in the same way to either address his/her comments or upload a new revised version. 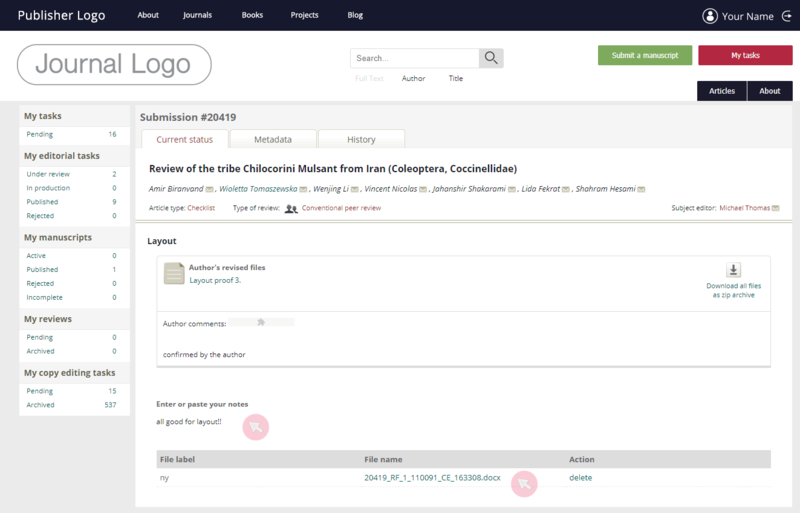 6 Use the History tab to access past versions of your manuscript. You will receive an automated email inviting you to submit proof corrections once your paper is accepted for publication and/or has completed the copy editing stage. 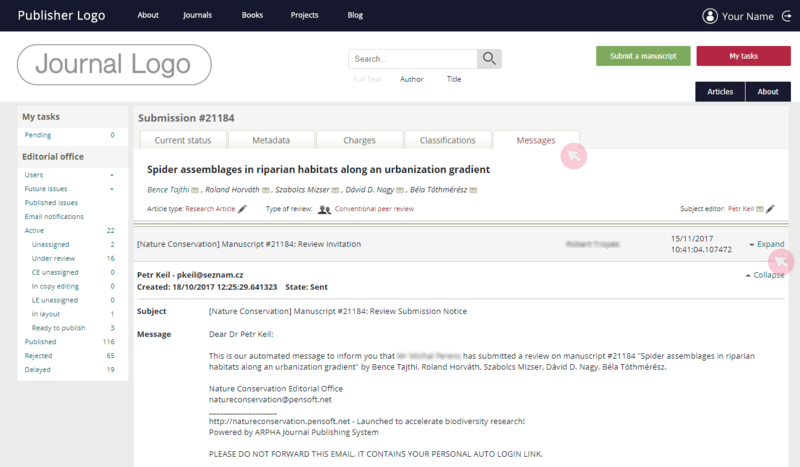 2 Go to the Current status tab to see the first proof of your manuscript uploaded by the Layout editor. Use the button on the right-hand side to download the proof in PDF format. Note: Ensure that you carefully examine the proof. Your article will be published in the way it appears in the latest proof approved by you. 3 Use the two available options to select: either to submit corrections to the proof or confirm that it is ready to proceed to publication. Note that the space below will change according to your choice. 4 To submit your proof corrections, type in a title in the File label field and then click the Upload file button to upload the PDF file containing your track changes and/or inline notes. Use the Author’s reply text field to leave your comments to the Layout editor. Note: All authors can access and download the proofs, leave comments and upload files. However, only the submitting author can submit. 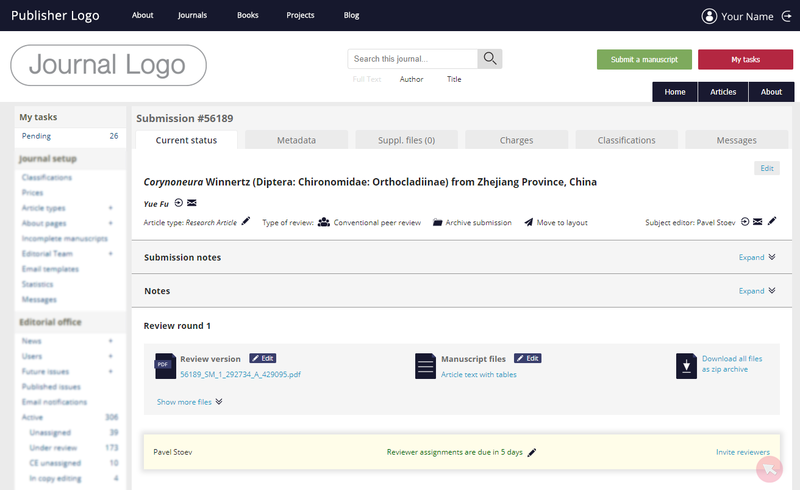 The submitting author can also edit and delete the files and comments provided by his/her co-authors. 5 Click the Proceed with publication or Submit revised version button at the bottom. Showing will be the button corresponding to the option selected above. The layout stage will take as many rounds as necessary until you confirm that a proof is ready for publication. Note: In case you have made significant changes to the content of your manuscript during the layout stage, you will be contacted to justify your edits. Please do not alter the content of your manuscript following its acceptance for publication. 1 Access all your published articles from the Published tab in the My manuscripts menu. Click on a title, to access the submission or use the clickable link in DOI column to go to the published article. 2 Go to the Metadata tab to see your article’s metadata used for indexing. 3 Go to the History tab to access your article’s past revised versions throughout the review, copy editing and production stages along with all reviews and Editor’s notes submitted via the system. Click on the symbol on the right-hand side to download the corresponding files. To download files one by one, click on their titles.